The plan had been to head to the Yorkshire Dales with Martin, however a bug laid him low. I decided that it would be good to save the route for another time. 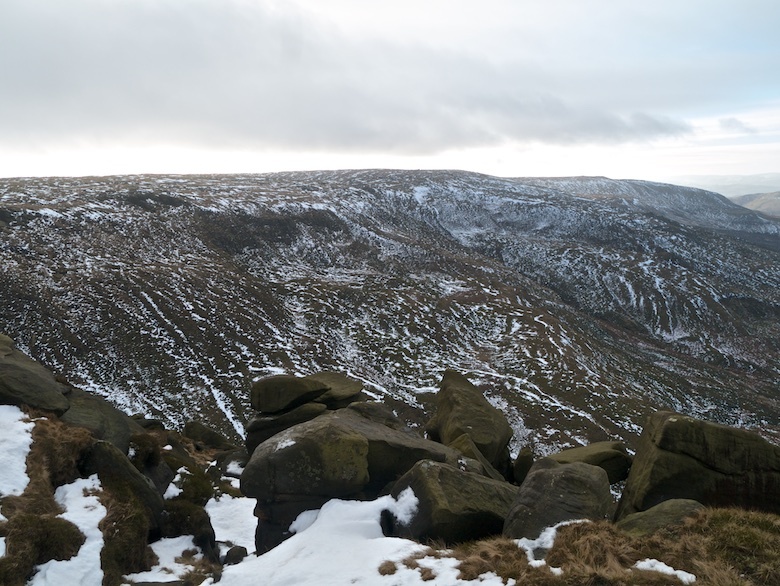 Maps were dug out and Kinder Scout caught my eye, its been a while since I have walked there. After an email to Chrissie and a Twitter exchange with Yuri I got mine and Reuben’s bags packed. 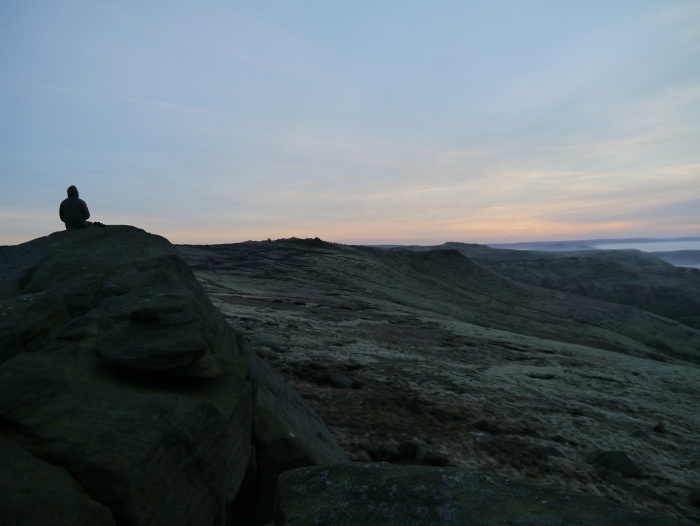 I have needed a new pair of waterproof trousers for a while now, so took the opportunity to pop into Outside in Hathersage on the way up. It was Reuben’s first time in an outdoor shop and he was more exited than I was. It is difficult having a browse when you have a dog straining at the leash. The best bit came when I needed to go into the changing rooms to try something on. I handed Reuben over to one of the shop assistants, coming out to find him on his back with his belly in the air and getting a big fuss from other customers. 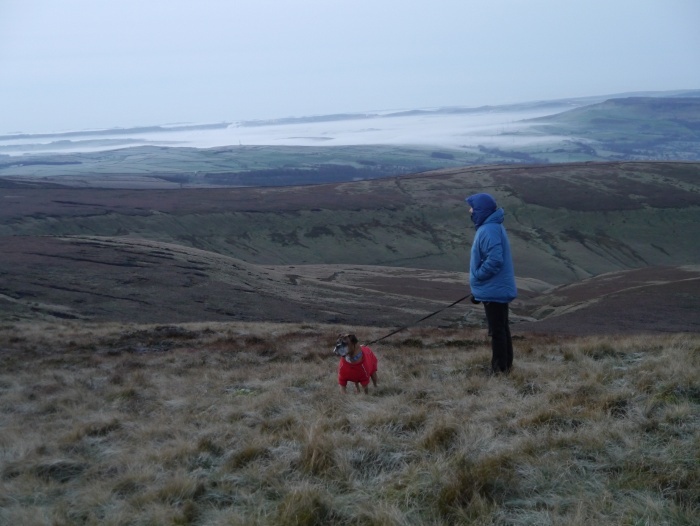 Yuri was picked up from Chinley station and we headed to Chrissie’s house in Hayfield just in time for lunch and coffee. 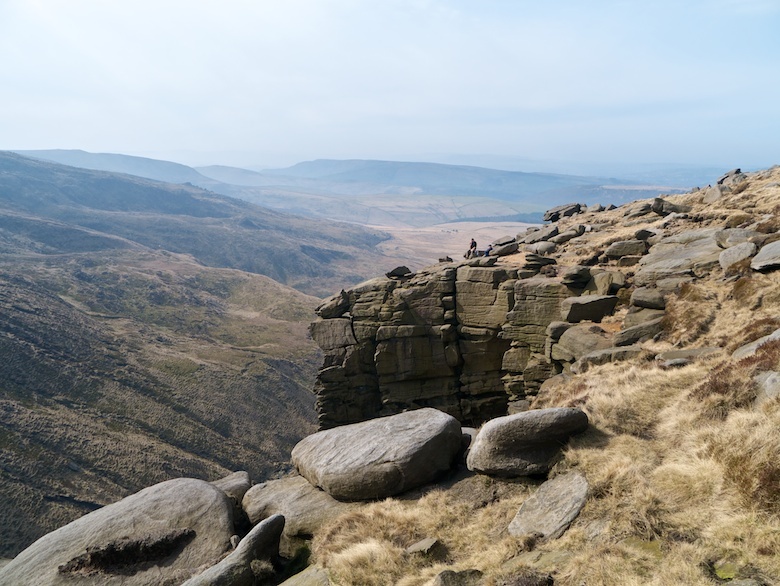 I don’t think that Chrissie really appreciates just how lucky she is being able to walk up Kinder Scout from her back door. 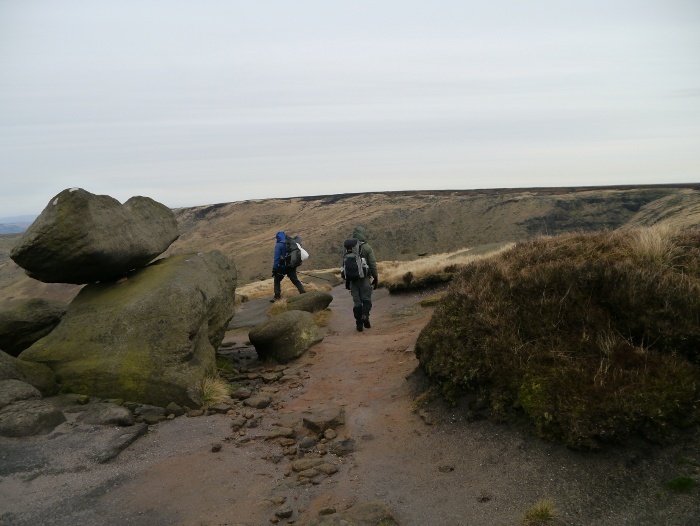 The approach through the village and then along Kinder Road is a bit of a slog but we were soon at the reservoir. A warm and sunny day but plagued by a haze that really limited the views. 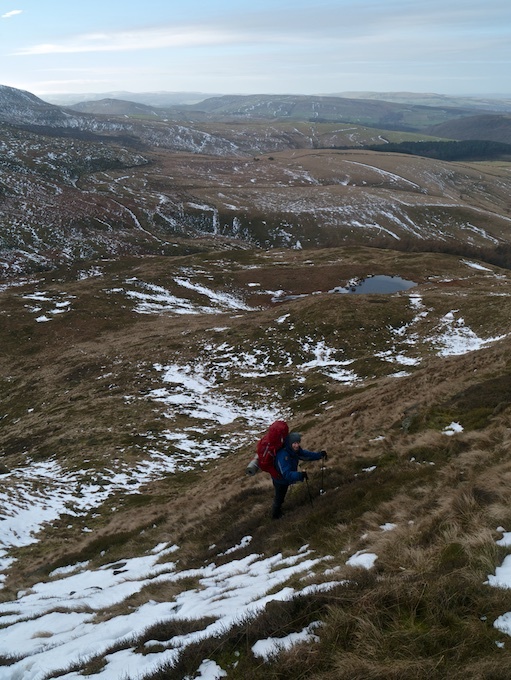 We headed directly up the quiet Sandy Heys path, which is a bit of a lung buster and thigh wobbler. 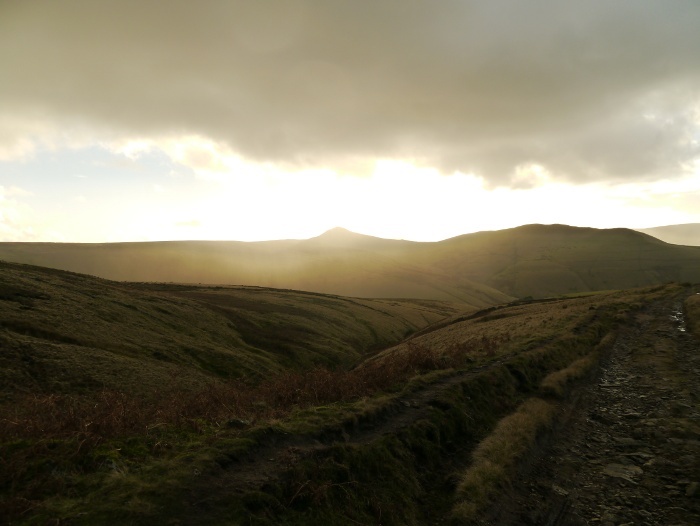 It leads unerringly direct to the summit plateau. With time on our side we were able to take it easy however. 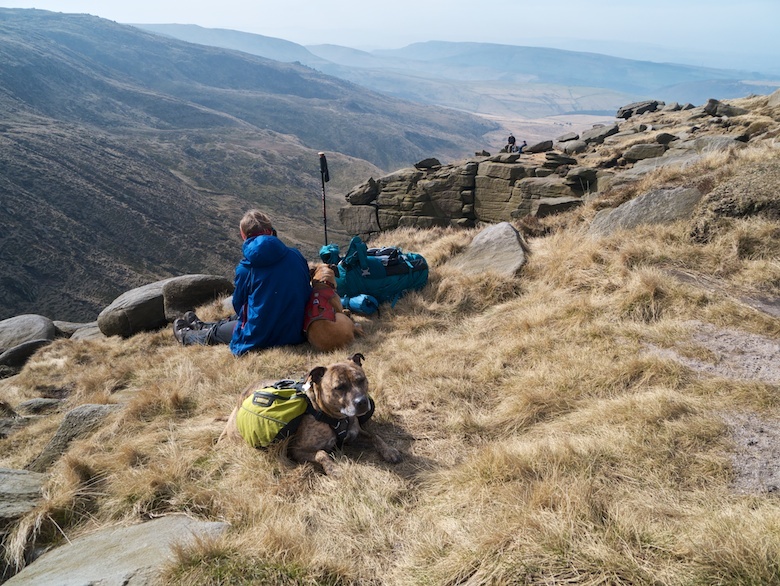 The plan had been to camp near the Kinder Downfall but despite the sunshine there was a very strong wind blowing from the east. Shelter was needed and we found a nice shelf below the western edge. There was one problem with our chosen pitch though, there was not so much as a muddy puddle to filter water from. Yuri assured me that it was a short walk to and from the spring near the downfall. His definition of short does not relate to mine and it was a forty-five minute round trip to fill our water bottles. 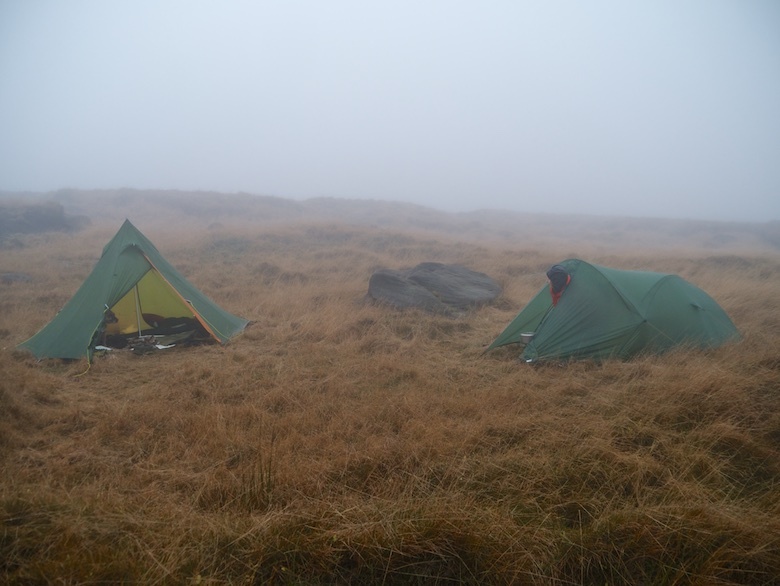 It was a cracking place to spend the night, the lights of Manchester eventually revealing themselves through the haze. 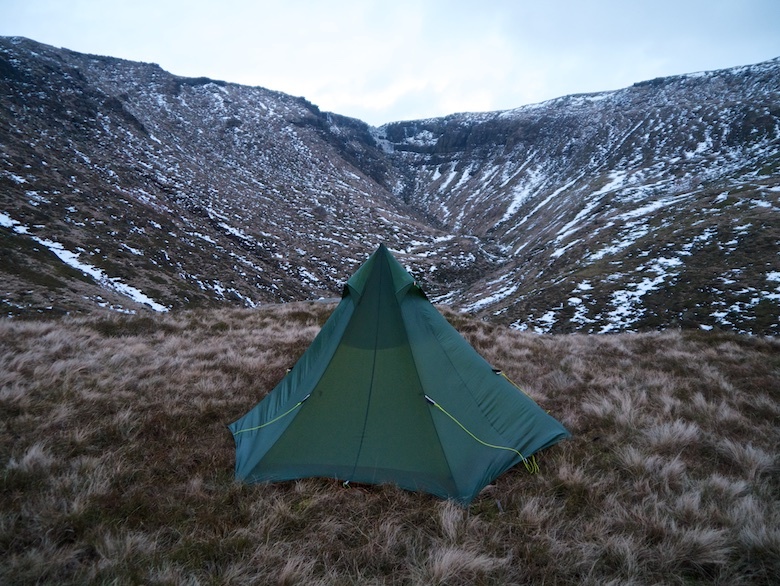 Even in a sheltered spot the wind blew strongly and we all retired to our tents early. Spot the three tents below. The morning brought bluer skies, although it was still very hazy. The wind still had a chill but it was warm in my tent. Being a short trip with Reuben I had lugged my original Voyager tent with me. A proper old school bomb proof shelter which makes camping a joy. Sadly it is a bit of a heavy beast. We had a lazy morning, enjoying the sunshine on the first day of British Summertime. We finally packed late morning and headed back up to the plateau. 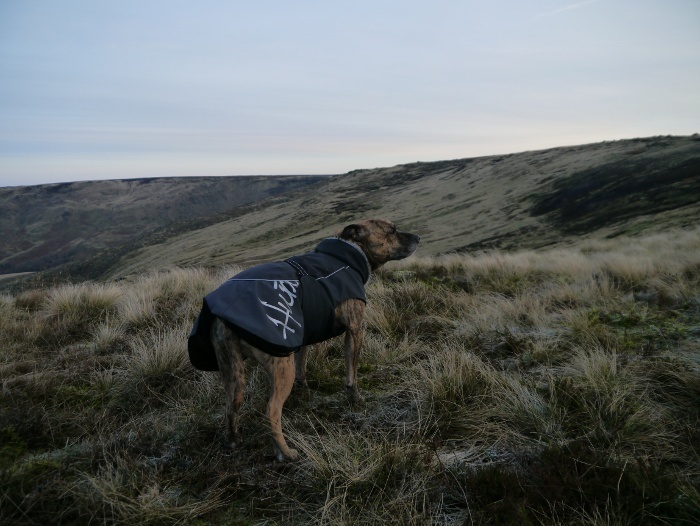 Yuri decided that he would head north to Bleaklow and descend to Glossop to catch a bus home. 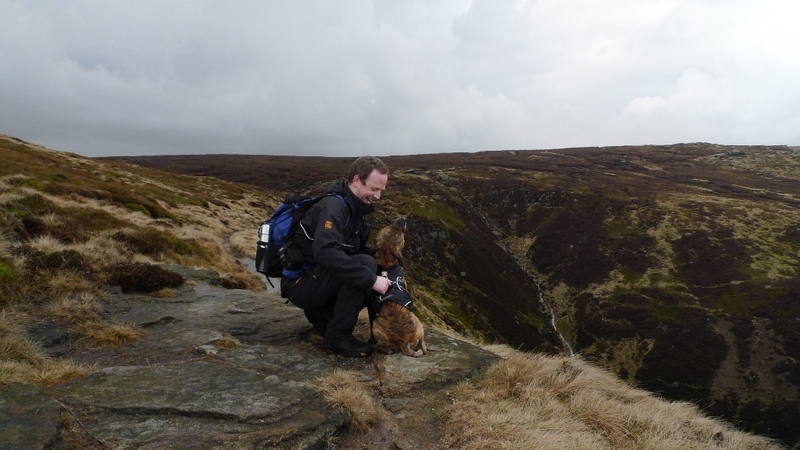 Chrissie, Dixie, Reuben and myself took the path towards Kinder Downfall. I have to say that it is one of those spots that always surprises me with just how impressive it is. 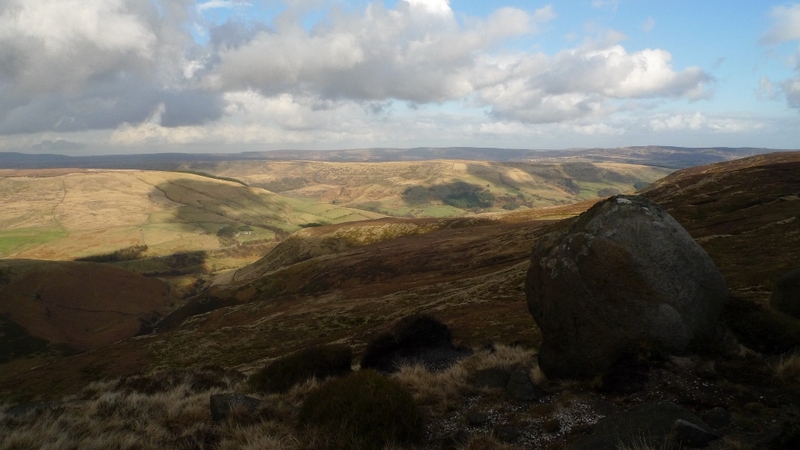 With Kinder Scout being so close to large urban centres it is easy to dismiss. Usually the downfall is teeming with folk but for some reason it was nearly deserted. Perhaps people were out doing things for Mothers day. With the temperatures rising we sat and soaked up the surroundings for a while. 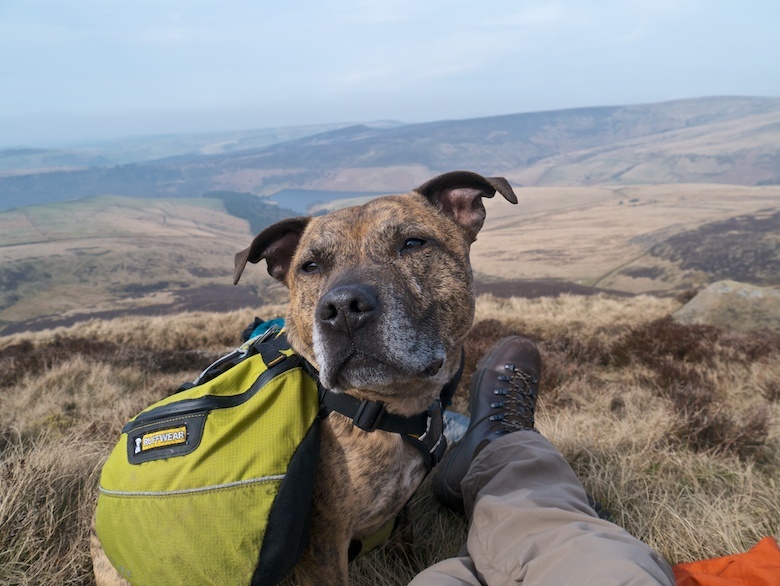 We took the less frequented Three Knolls path down to the reservoir, although not before another sit in the sun, Reuben ever hopeful for a biscuit. 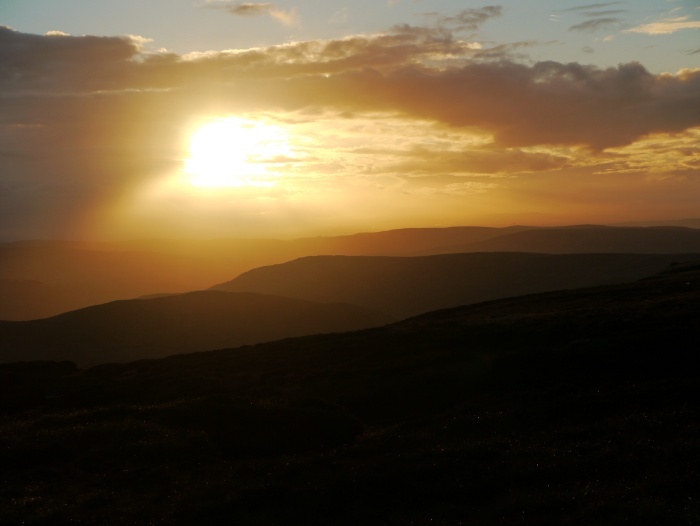 An enjoyable night in the hills does not need to be big or epic. The weather has been pretty apocalyptic recently, constant heavy rain making the short November days even more miserable. 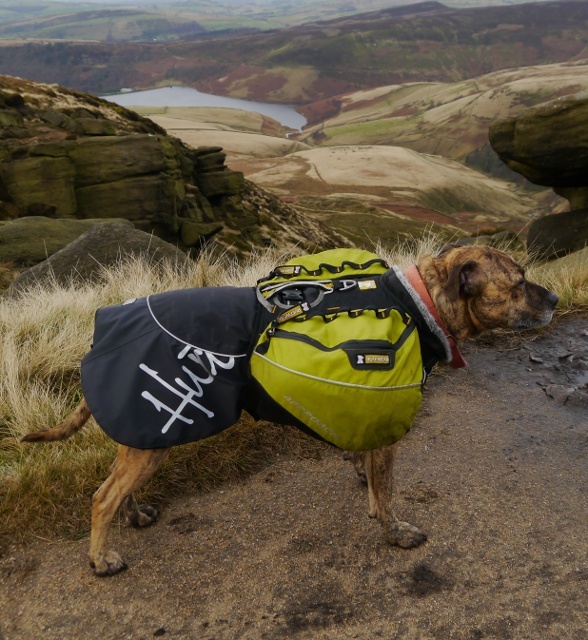 At this time of year it is easy for outdoors lassitude to set in, especially with regards to backpacking. 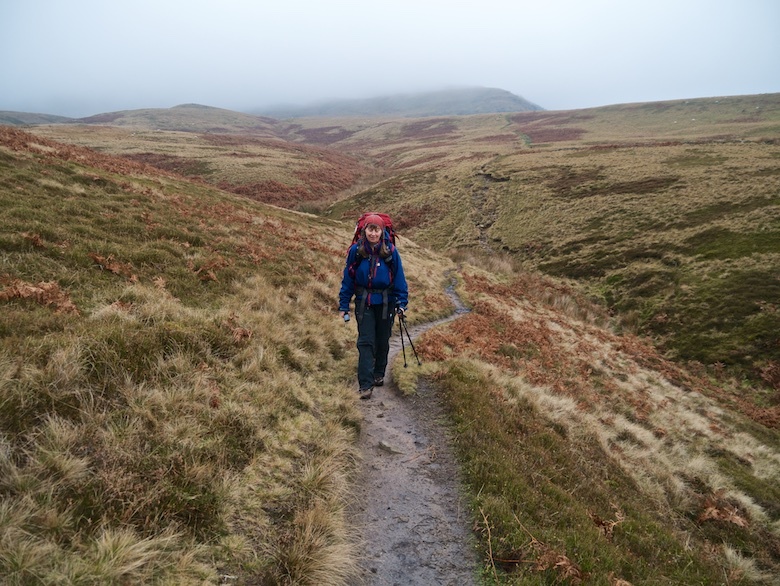 It gets increasingly difficult to force yourself out of your warm bed to walk over a wet and windy hillside. 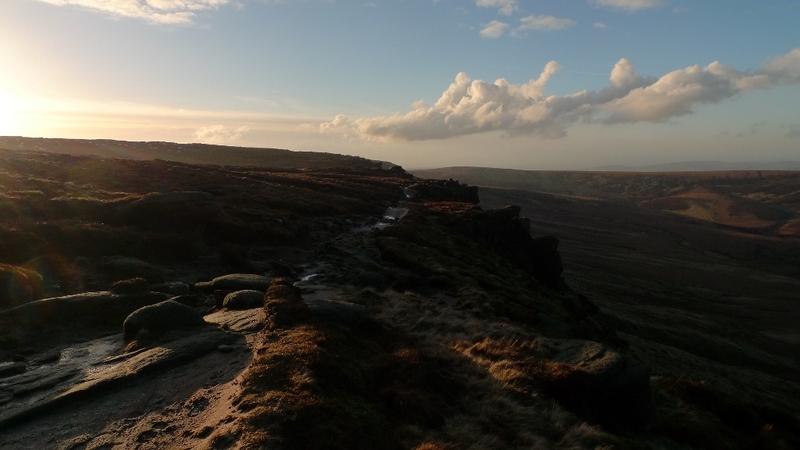 However this weekend there was a brief promising weather window, clear and calm conditions over the Peak District in between weather fronts. It would be a shame not to take advantage of it. Late Friday morning (after enjoying a lie-in) I collected Rich from his house, Reuben whining excitedly from the back seat of the car. We arrived at Chrissie’s house in Hayfield a couple of hours later after a pasty stop in Baslow. We sat in her kitchen for a while to consume even more food and enjoy a coffee. By the time we set off there were less than three hours of daylight left. Chrissie led the way though the large but attractive village of Hayfield. 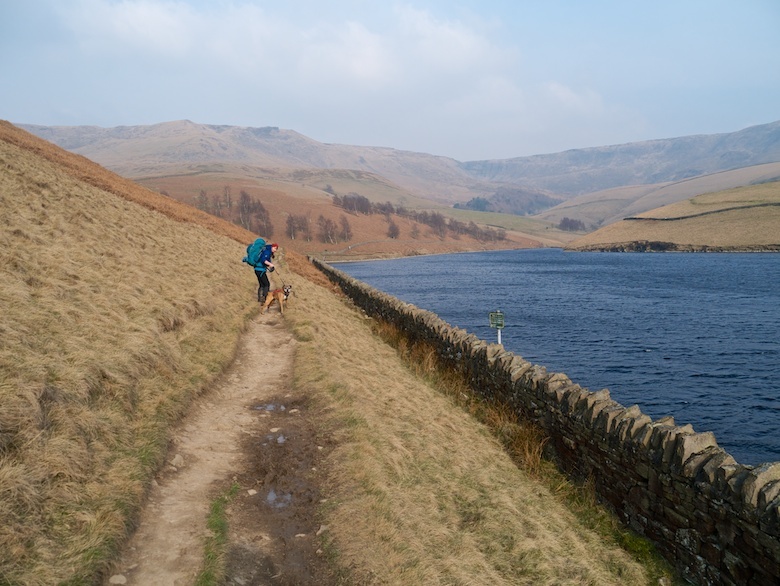 We were soon walking through open countryside along Kinder Road, which we left just past the car park. A surfaced track then took us beneath the bulk of Mount Famine and South Head, two underrated and rather neglected hills that give a good ridge walk. 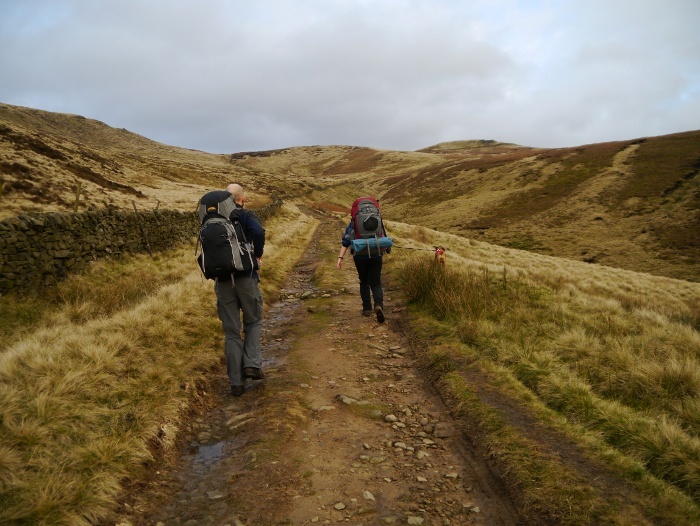 We then started the climb on the bridleway that leads to Edale via Edale Cross. I had expected clear sunny skies but soon after starting our climb clouds started to build from the west, lines of showers drifting through the low sunlight. 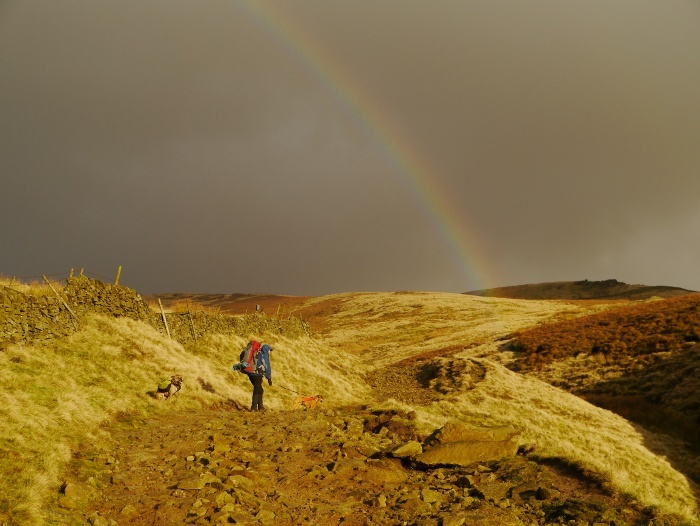 The outcome of sunshine and rain at the same time was a rather spectacular rainbow, dark skies and the western flanks of Kinder giving a sombre backdrop. One end of the rainbow appeared to be coming out of the ground just a few metres ahead of us, something I have not seen before. 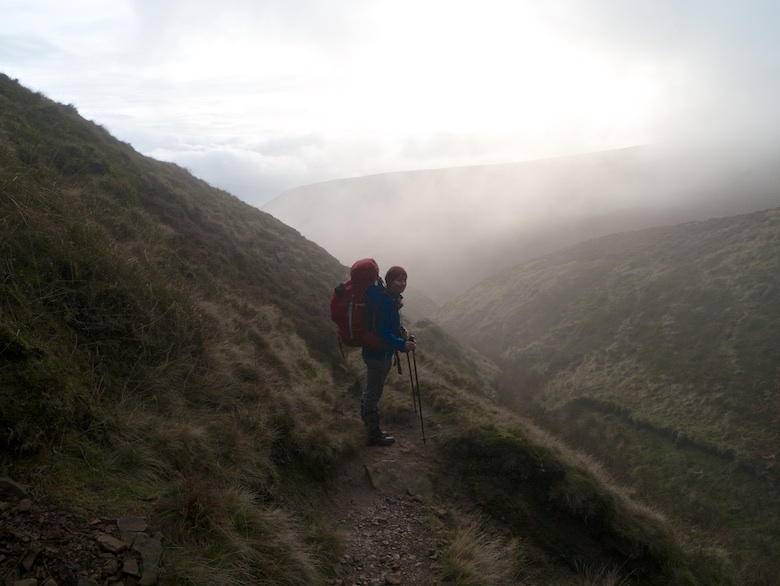 We made swift progress up alongside Oaken Clough, finally reaching Edale Cross. 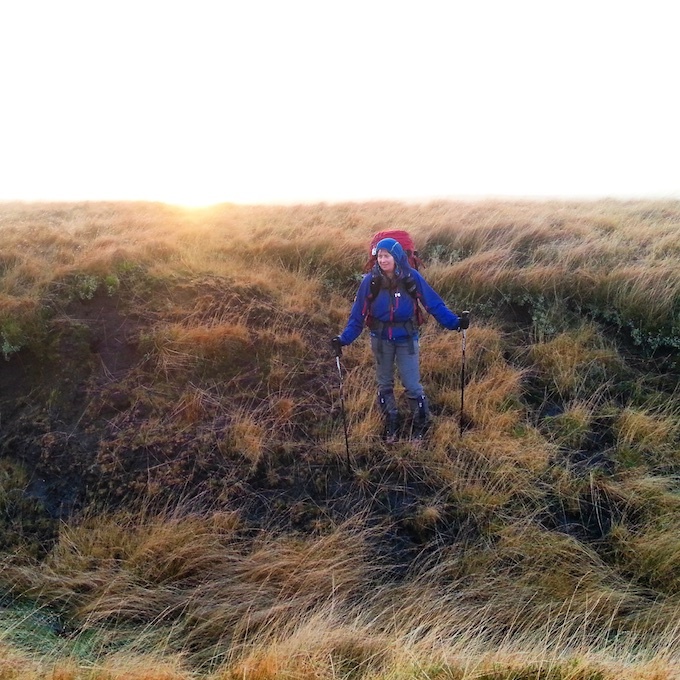 This is familiar ground for Chrissie and she led us up a path that contours around the steep slopes of Swine’s Back. 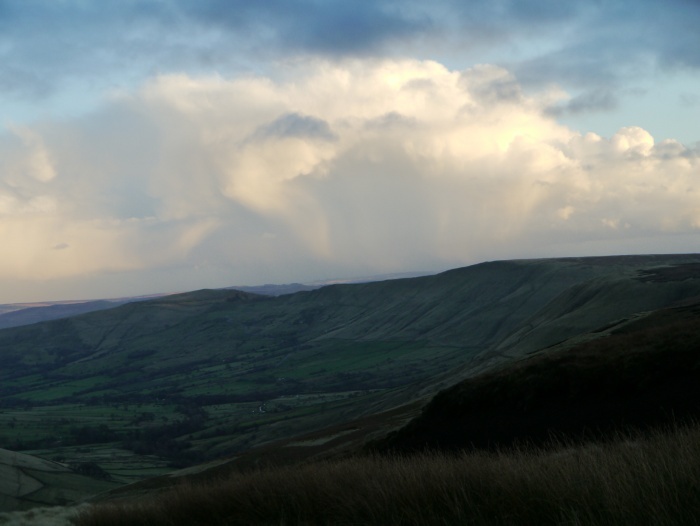 Ominous clouds were building above Rushop edge but thankfully the sky was beginning to clear once again towards the west. Hopefully we would be treated to a clear star filled night. 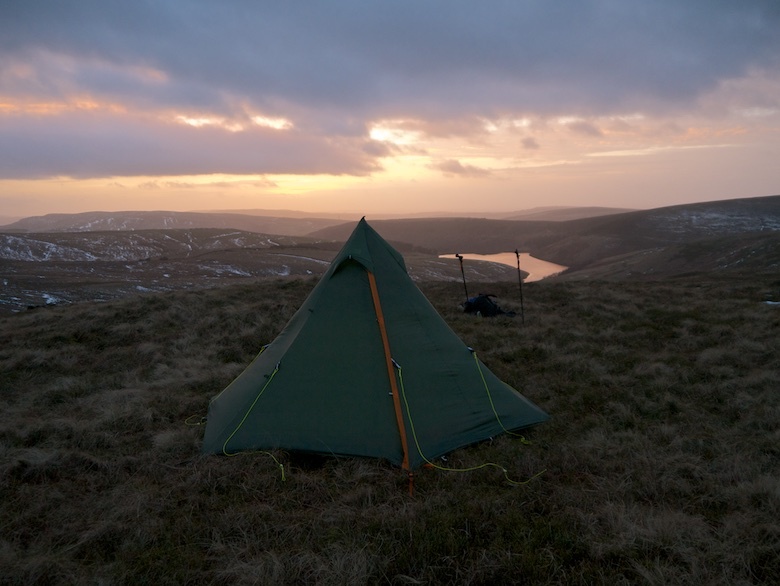 The aim was to pitch our tents and then sit and hopefully enjoy a sunset. 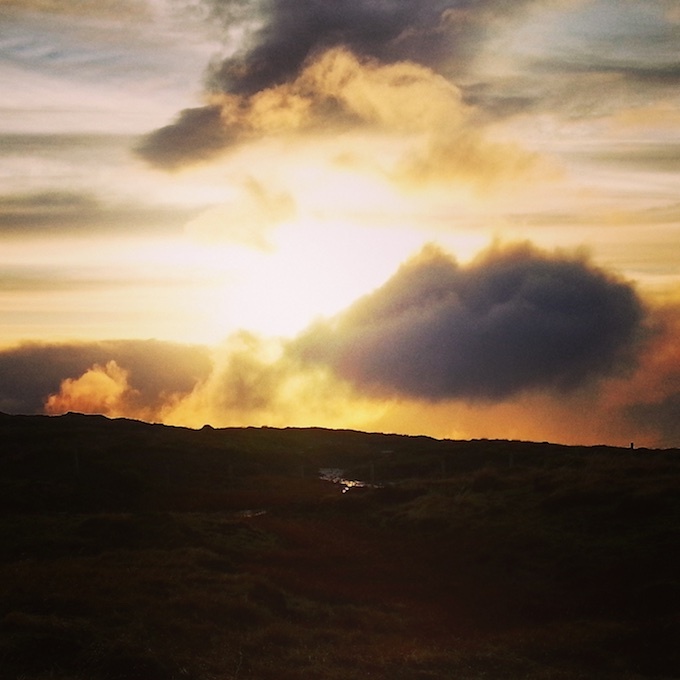 We were still a way from our intended camp spot when we were treated to a brief fiery display. It only lasted a couple of minutes before the sun was swallowed by the clouds, successive ridges were dark silhouettes against the orange glow. 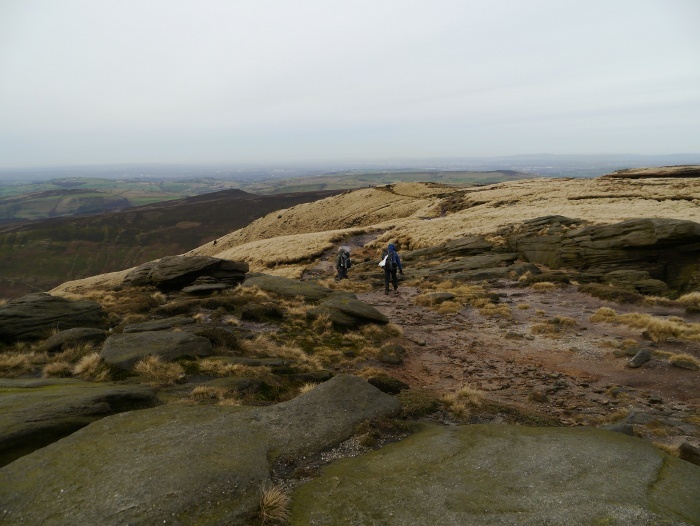 Our chosen spot was exposed but relatively dry for Kinder Scout in late Autumn, especially considering all the rain that had fallen the day before. 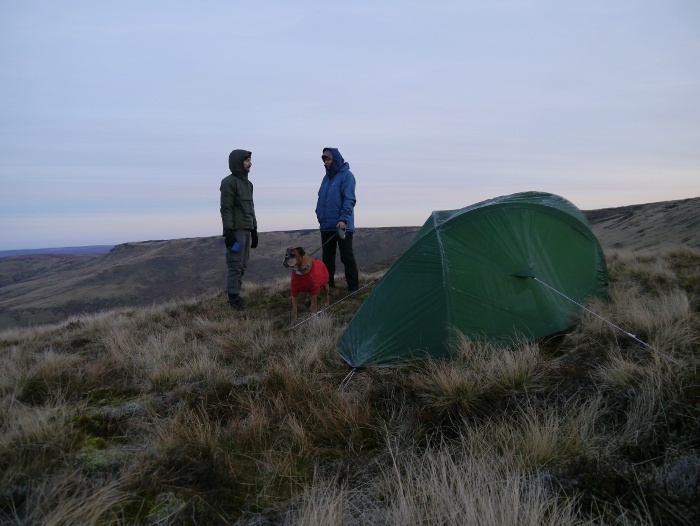 Tents were quickly pitched and we soon dived into our respective shelters to escape from the freezing wind, my weather device measuring a wind chill of minus three celsius just after dark. 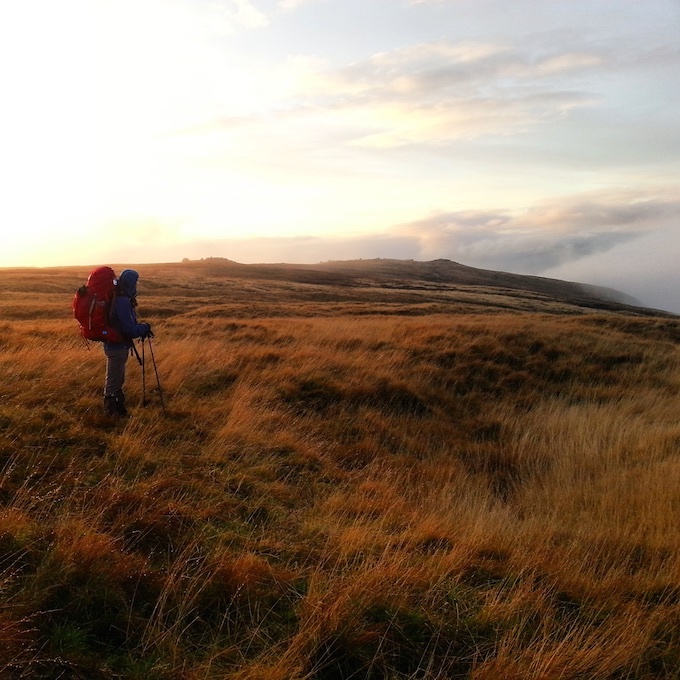 Usually when I wild camp I am in the middle of the countryside, as far away from civilisation as possible. 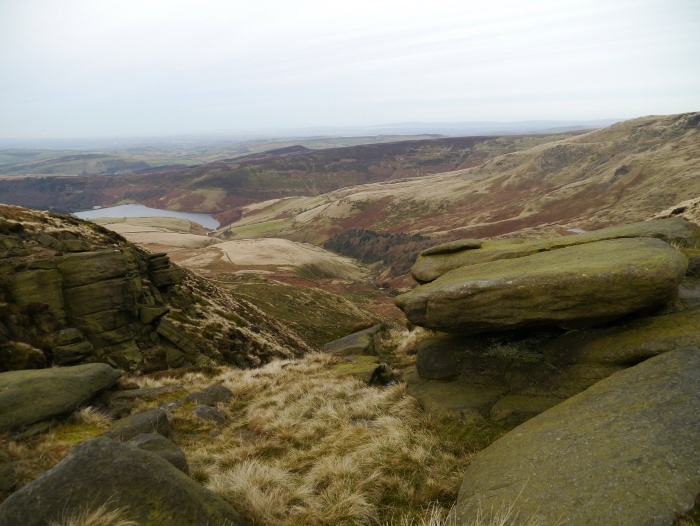 Here on the edge of Kinder Scout we were pretty much on the edge of a city, the huge sprawl of Manchester beneath our feet. The twinkling orange lights stretched as far as the eye could see, dirty jewels in the dark night. It was like being at the edge of two worlds. It was strange being up there, feeling so distant but at the same time close to those lights. Standing on that airy perch whilst the Friday rush hour was taking place below. 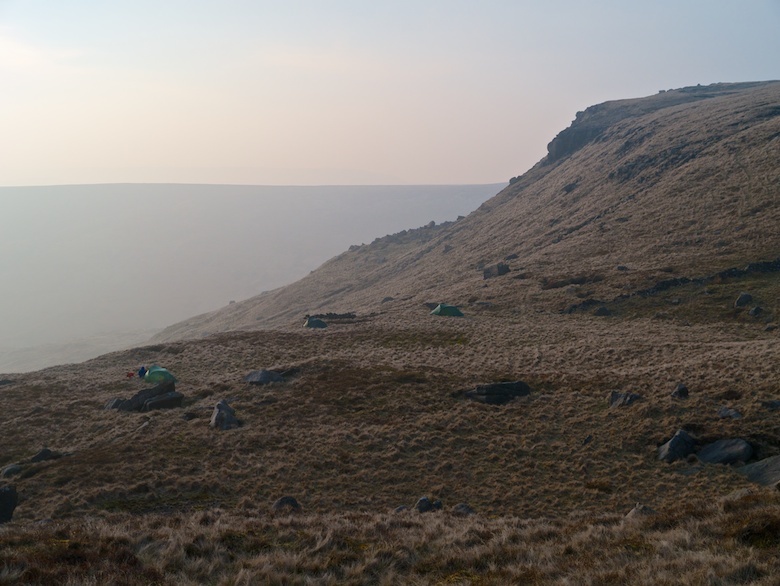 We were all in our tents when I first spotted a torch light in the distance coming from the direction of Edale rocks. Ten minutes later a figure emerged from the dark, sporting a head torch and an accent. 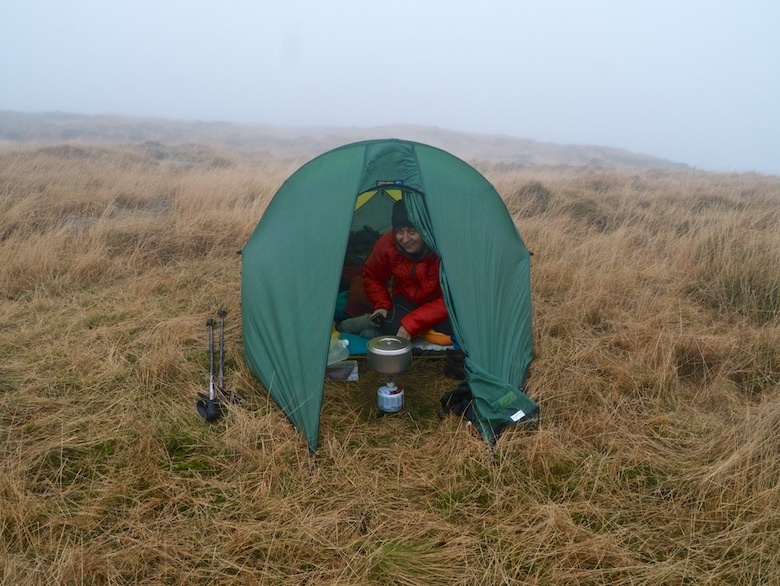 It was Yuri who had walked up from Edale railway station in the dark to meet and camp with us. We managed to stand around chatting for about half an hour before the chill sent us to our tents for the rest of the night. 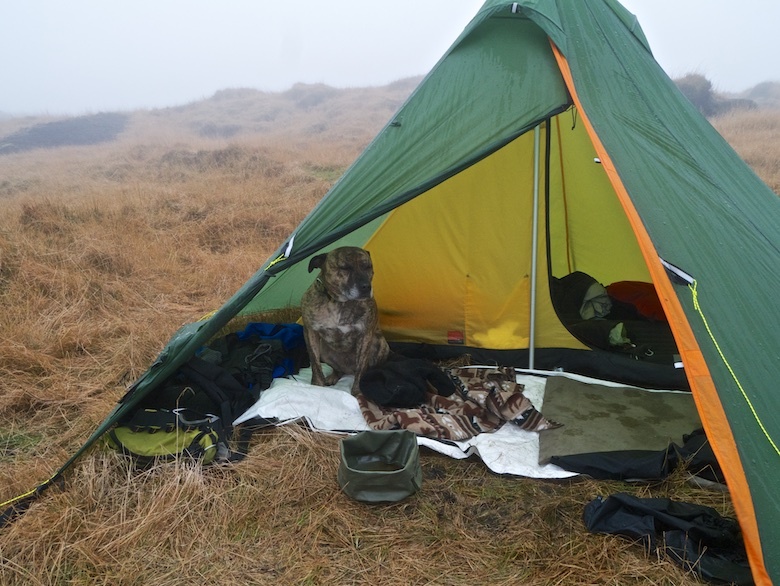 I slept remarkably well, both mine and Reuben’s body heat keeping the temperature just above freezing in the tent. My alarm woke me just after 7.00am and I unzipped an ice encrusted flysheet to peer into a monochrome world. 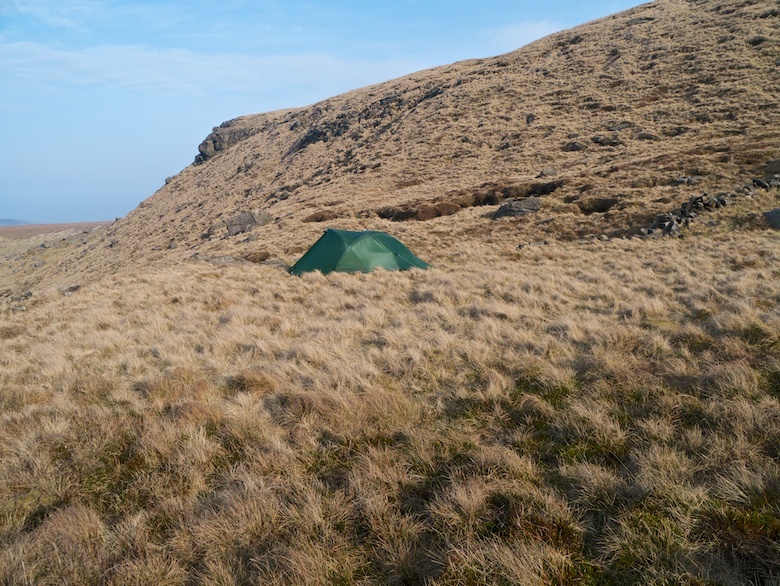 The sun had yet to rise and the landscape had a soft milky texture to it, frost coating the grass and our tents. I fired up my stove to make a coffee and we were soon gathered outside in the frigid air to await what would hopefully be a spectacular sunrise. Reuben however thought better of this and remained curled up on his blanket. 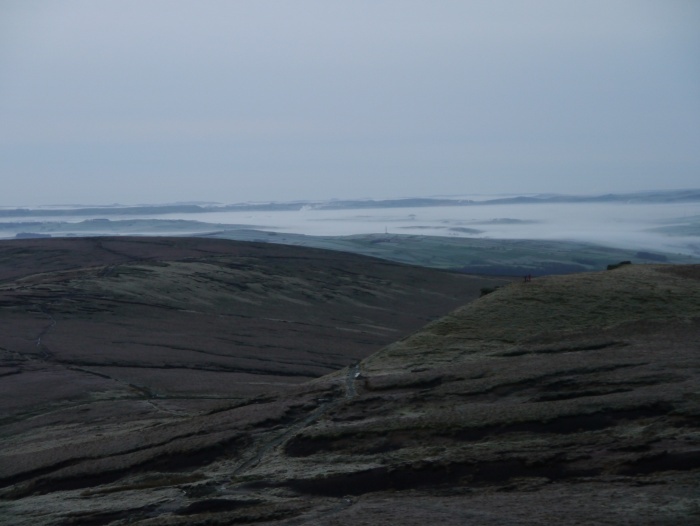 It was evident that there was a cracking inversion over the Derwent valley far to the east. Unfortunately there was slightly higher ground in the way of the rising sun. 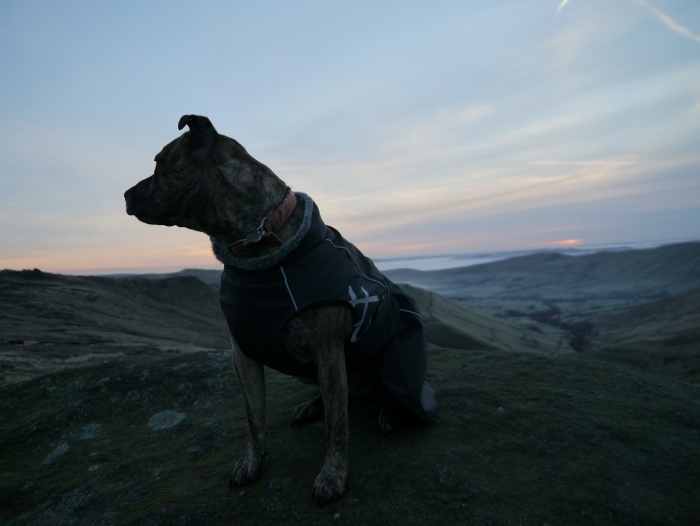 Therefore after waking Reuben I set off with Rich and Yuri to climb the rocky tor of Edale Rocks in the hope of a better view. 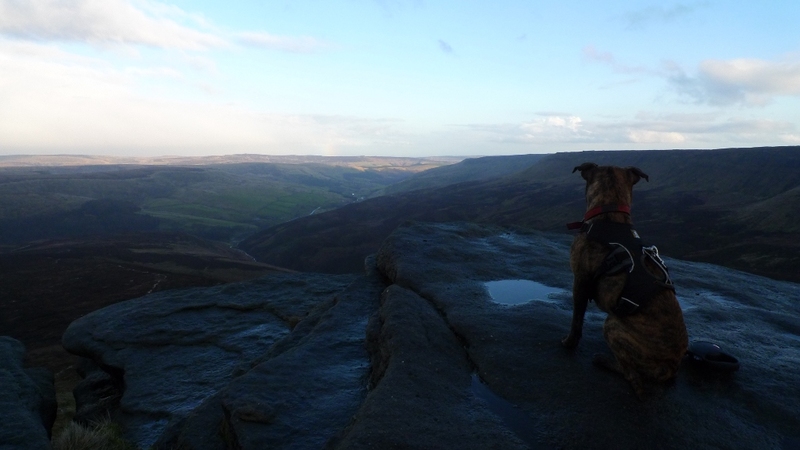 Reuben obliged by pulling his ‘dog on the mountain’ pose. From our vantage point it was evident that anyone on the summit of Win Hill that morning would have been in for a treat. 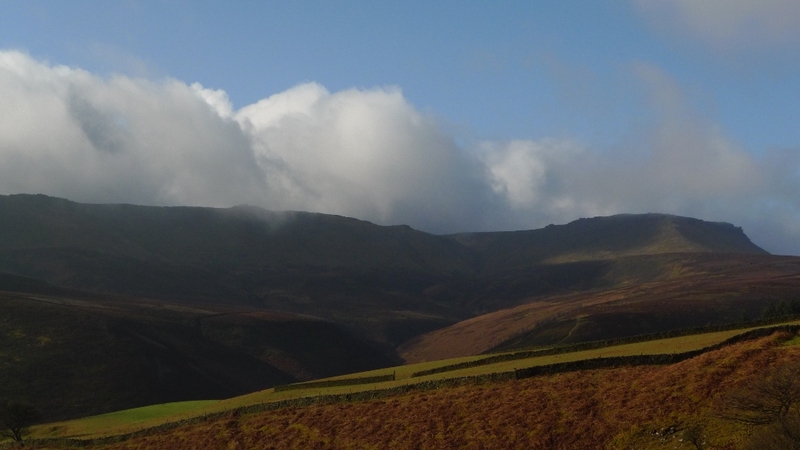 The upper Derwent was nearly full to the top with fog, higher peaks rising above it like islands. 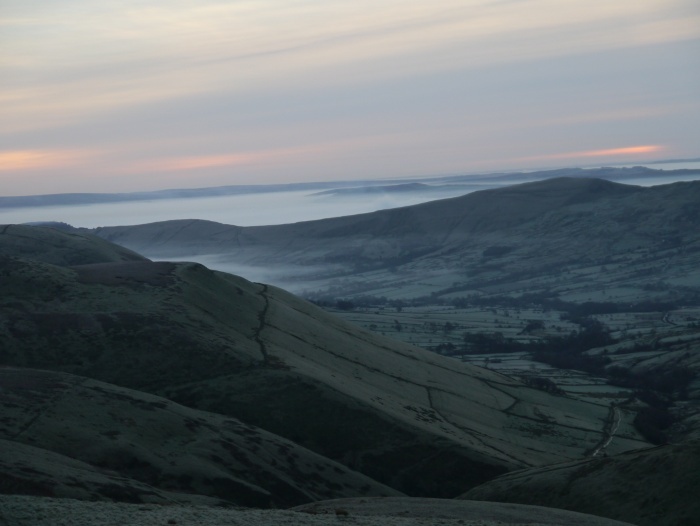 In contrast the Edale valley below us was almost fog free. To the south much of the white Peak was fog bound. We noticed a couple of figures on the top of Swine’s back waiting for the sun to rise. 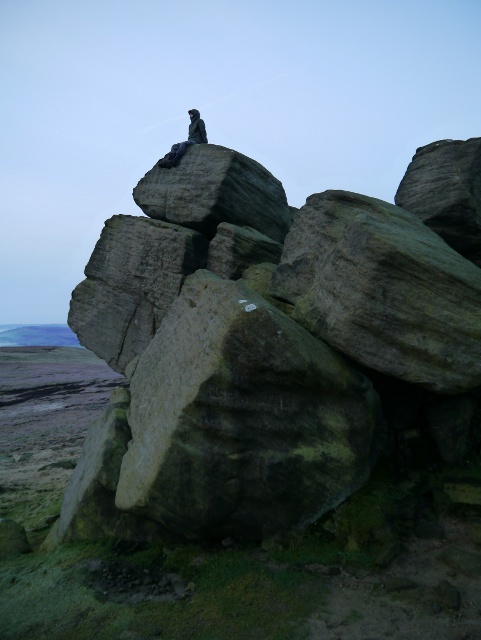 Edale Rocks is a great place to hang out in the pre-dawn light. Unfortunately the sunrise never materialised, it was like sitting and watching a cheap firework display in a grand setting. There was a brief fizzle before it was extinguished by a bank of cloud. Time to head back to the tents for more coffee and a hot breakfast. Packing up was a slow and rather painful affair for me. A couple of days previous I had managed to shut a finger in a door at work. The nail had turned black and my whole hand was still throbbing, any contact with that finger causing a lot of discomfort. Stuffing gear into my rucksack proved to be rather tricky. 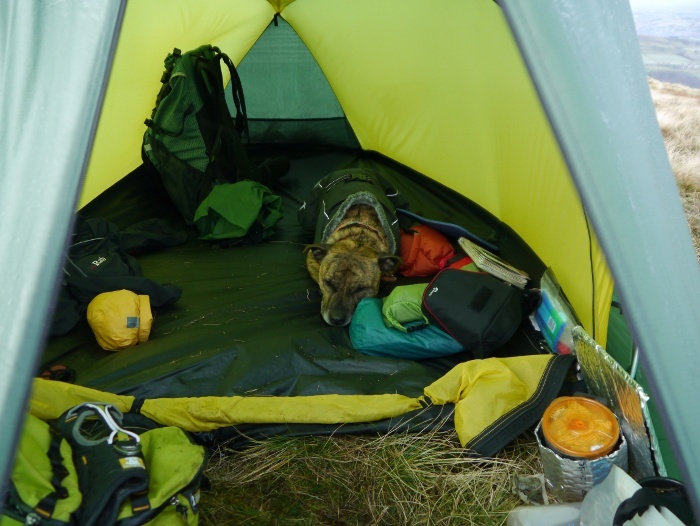 Actually the whole act of packing was made even more difficult by a dog that was more keen on being inside the tent than out! 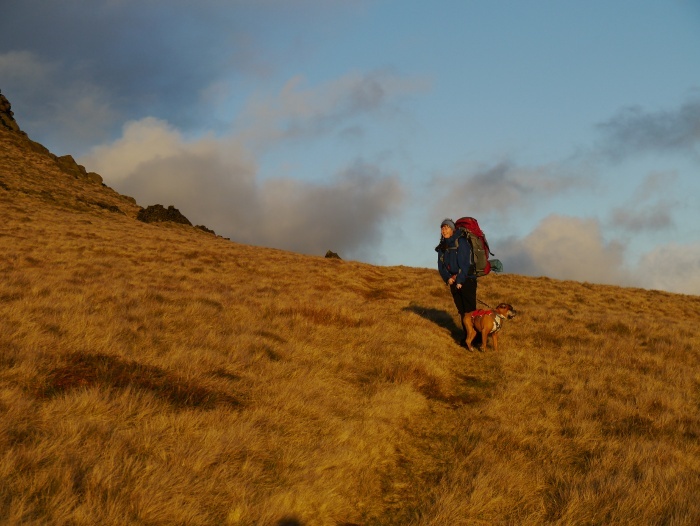 Due to the age of Dixie (Chrissie’s 11 year old boxer) Chrissie thought it best to head back to Hayfield the way we had come. 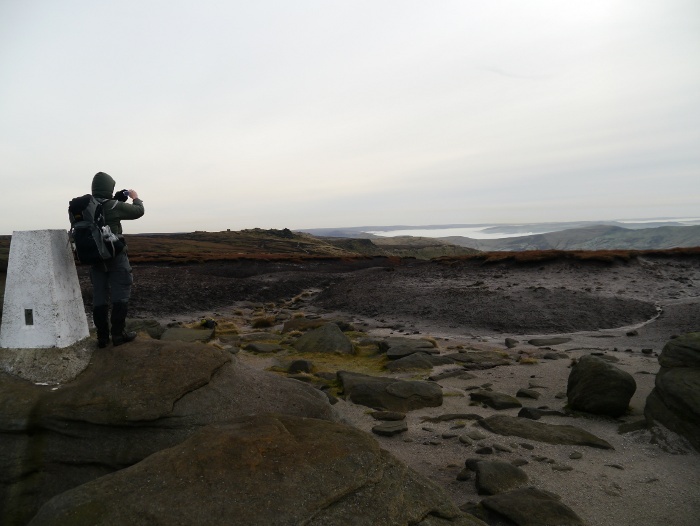 Myself, Rich and Yuri decided to have a wander over to Kinder Downfall to see what it looked like after all the rain we have had. En-route we stopped at the trig on Kinder Low which is an island surrounded by bare eroded peat. 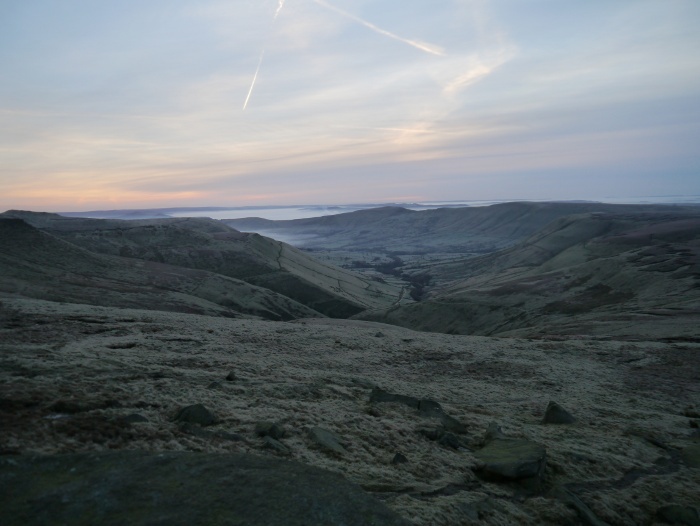 The inversion over the upper Derwent was still there, its residents probably having a dank murky morning. 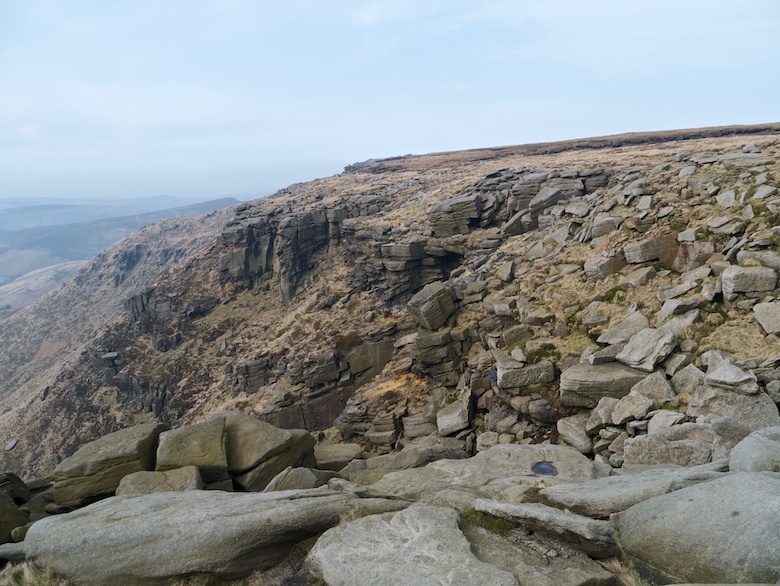 Strangely the popular western edge of Kinder Scout was almost deserted that morning. Perhaps the weather forecast for the afternoon had put people off venturing out. Already the sky had clouded over making the light dull, flat and uninteresting. Above Manchester there was a long dirty skid-mark in the air, smog had formed above the city. 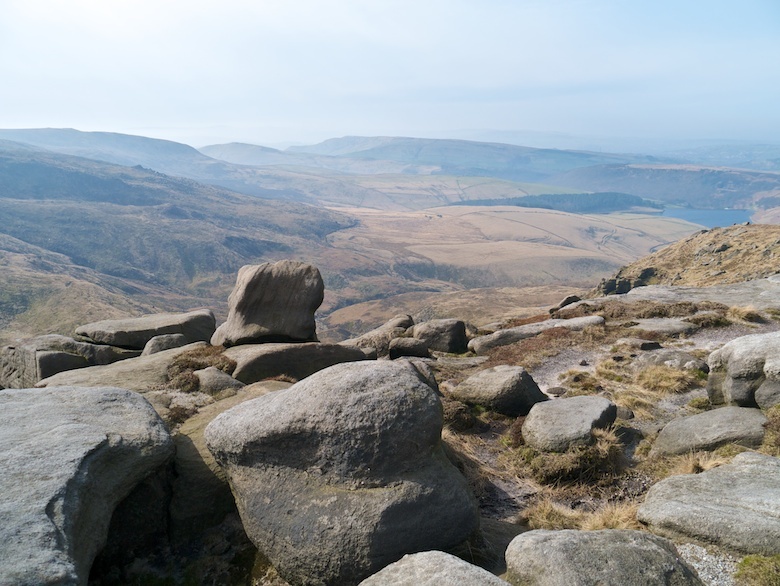 We continued walking north along the sandy path through interesting collections of gritstone boulders. 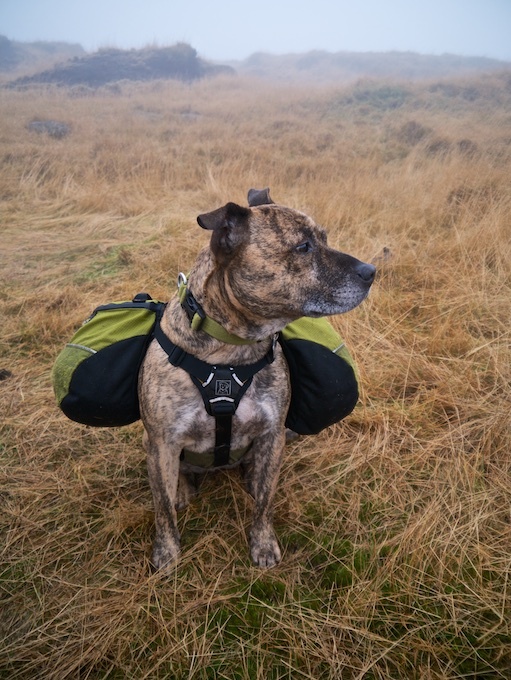 Due to the cold Reuben was sporting his snazzy new jacket underneath his backpack. 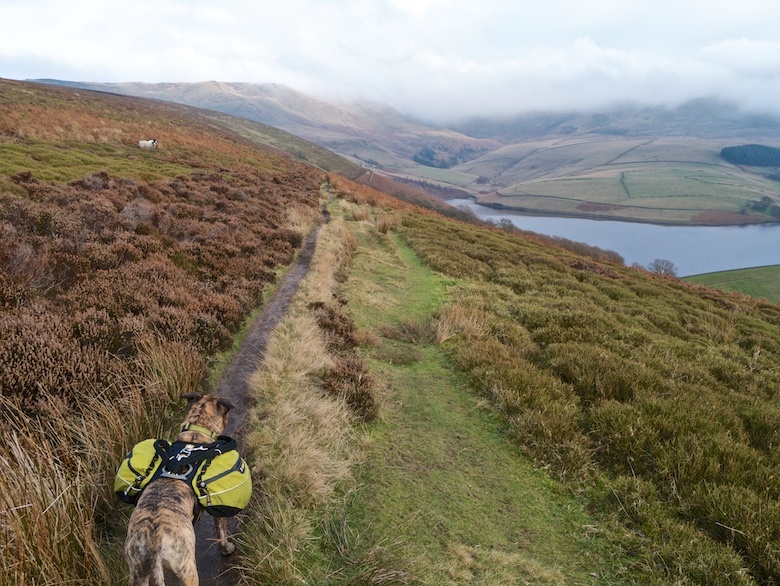 I was worried that he may feel a bit overburdened but once off the lead he was running about being his usual happy self, enjoying the freedom of the moors. Kinder Downfall had reverted back to its usual trickle, which was a shame as I have always wanted to see it in full flow. 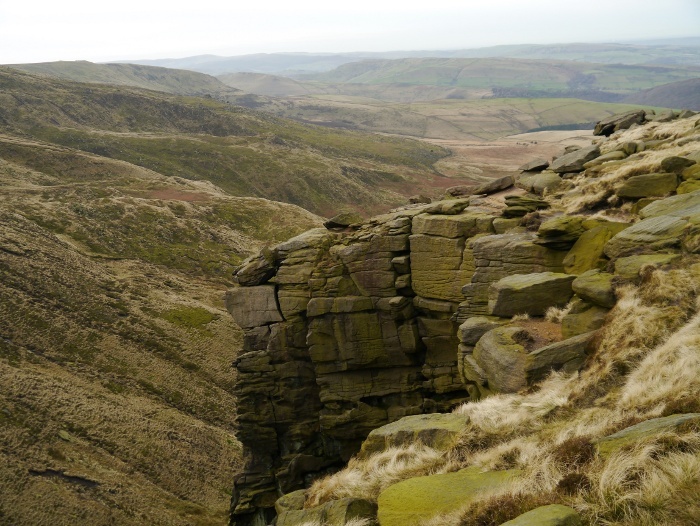 However it is always a grand spot, a deep rocky canyon making it one of the more impressive spots in the Peaks. In summer this often means it can be an immensely busy lunch spot. A worthy destination for a day out. Rich had childcare commitments and needed to be back in Nottingham by two so we soon set off along the edge, the weather appearing murkier by the minute. 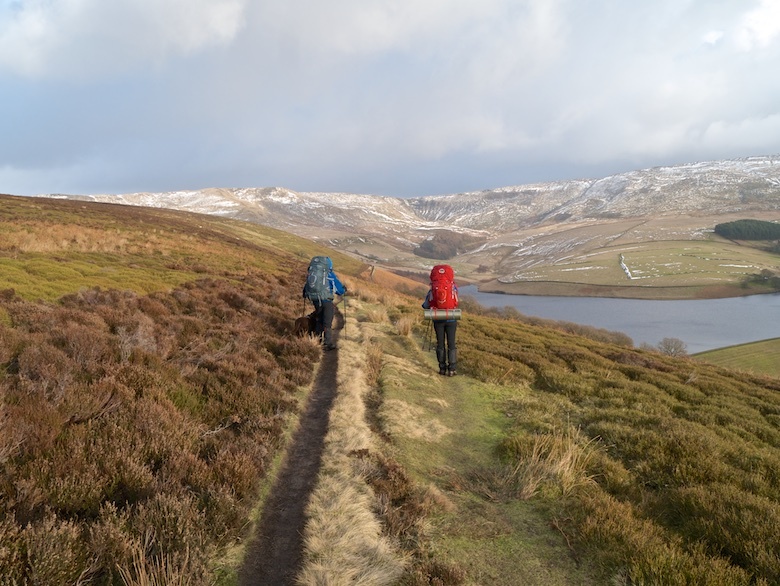 We had planned to descend via William Clough but spotted a path heading directly to Kinder Reservoir from Sandy Heys. 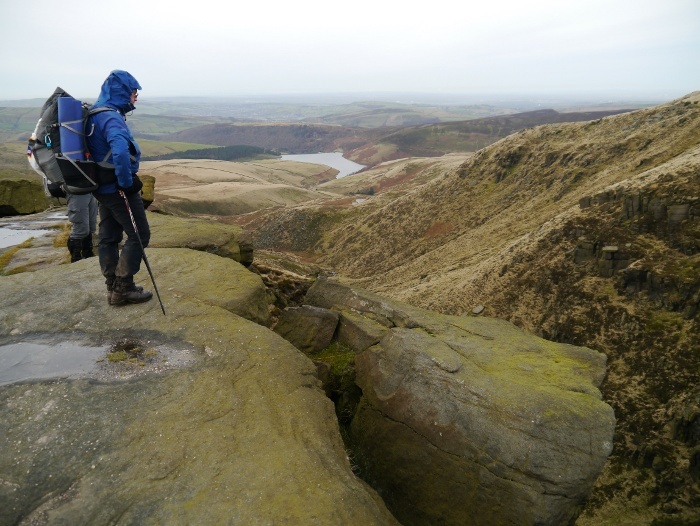 This gave a rapid knee jarring descent into the valley where a brisk walk along Kinder Road led us easily back to Hayfield. It had been almost exactly twenty four hours since we had left but it felt like we had been out for much longer. 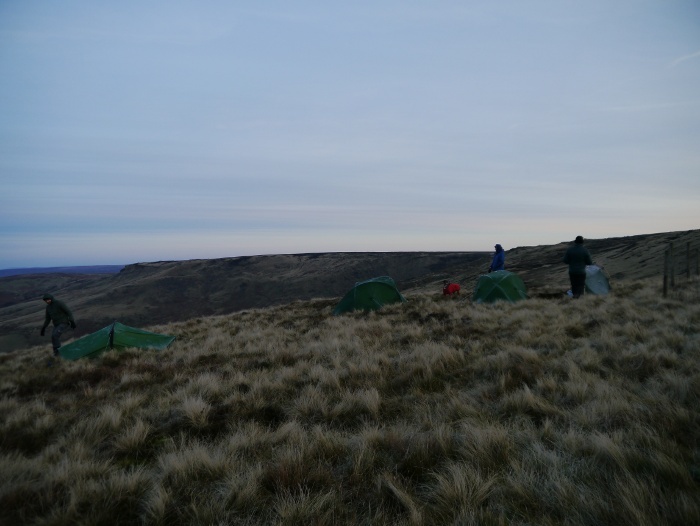 We had not walked great distances but a camp on the summit of Kinder had added to the adventure. 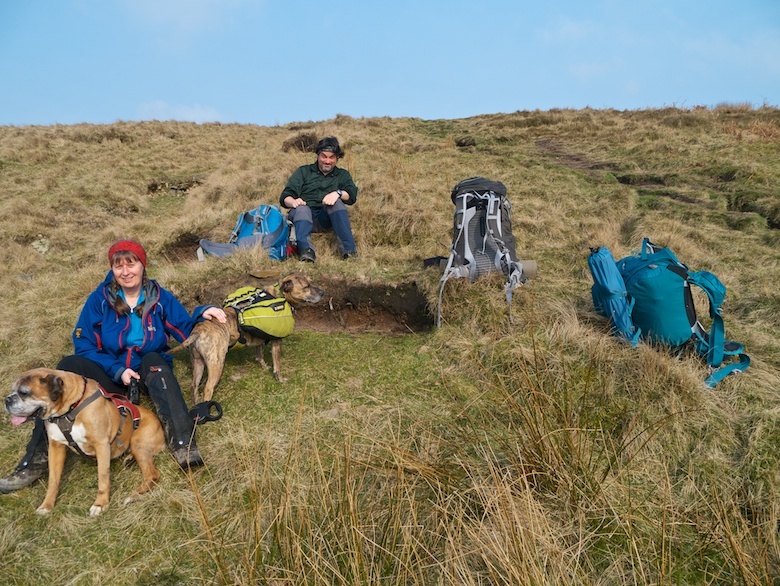 An enjoyable hill experience in good company. 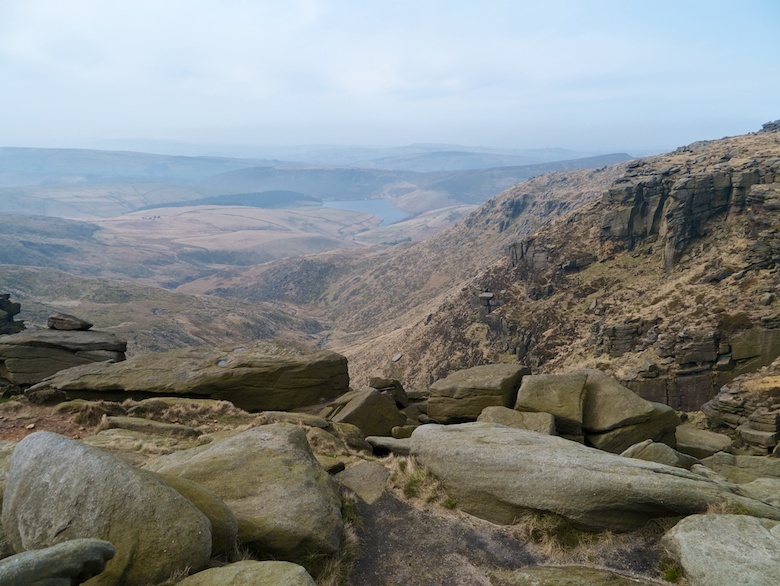 Kinder Scout has a magical appeal for me. 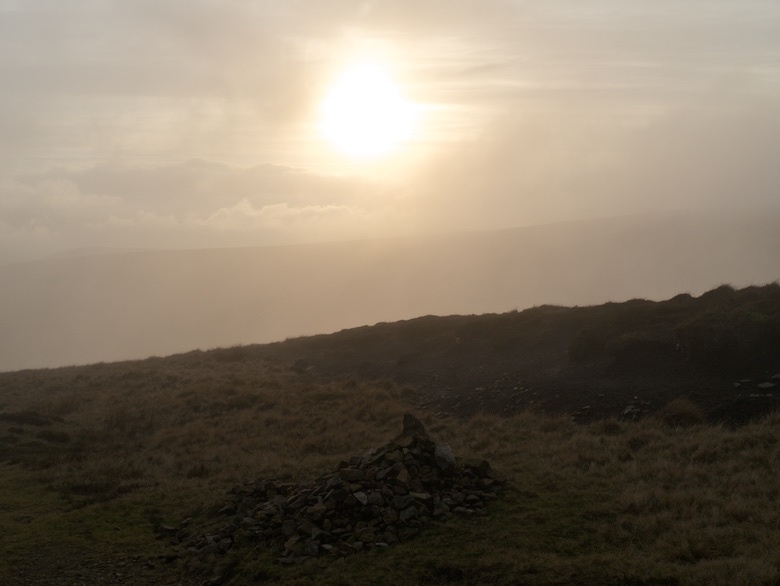 The Kinder and Bleaklow moors are my closest area of high ground which over the years have been explored in pretty much every combination possible. 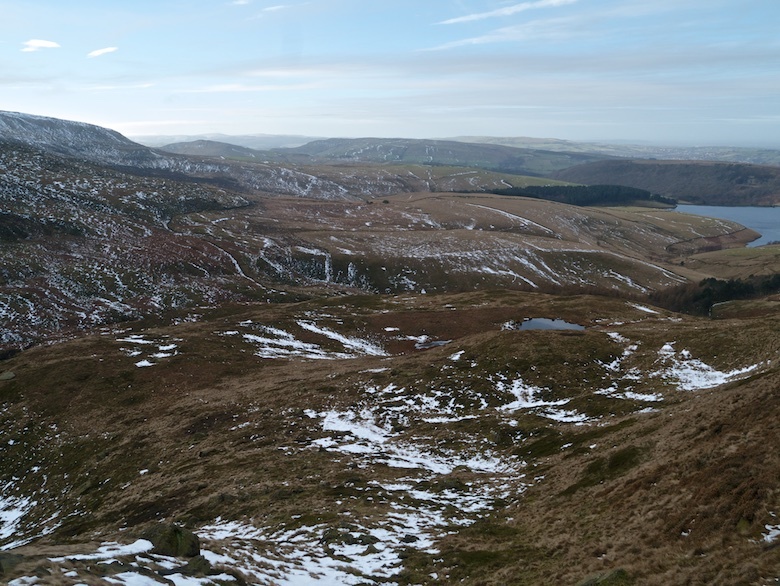 The best bit of Kinder in my opinion is to the north where its edges drop down steeply to the Snake Pass, with the whole of Bleaklow as a backdrop. 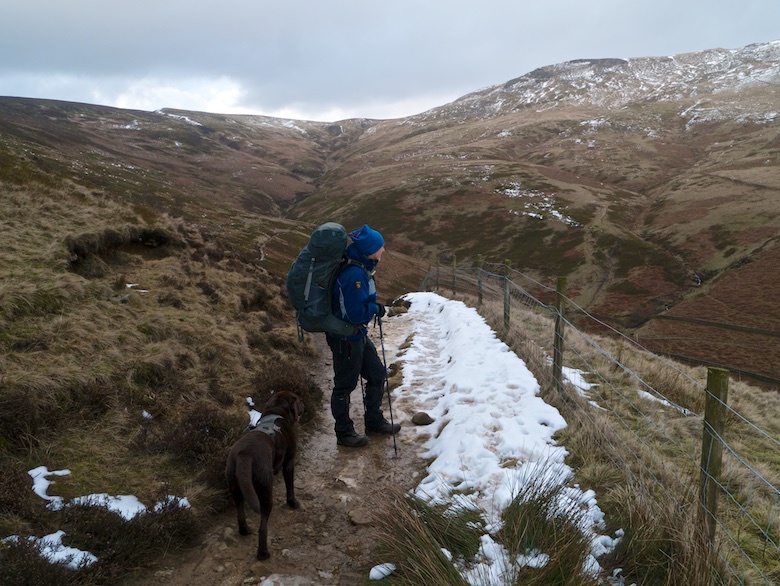 The walk from Birchin Clough up Fairbrook, then along the edge before returning along the Snake path is one I have done several times. This time I really wanted to walk the entire northern edge, something I have not done in its entirety before. I was disappointed to find the food van was not parked at the layby in Birchin Clough when we arrived. I really fancied a fried egg sandwich! Usually this large layby can be very busy but not this Saturday morning, even though the forecast for later in the day was good. A stile leads to a path though the woods that is not marked on my map, this eventually meets up with the right of way above the Snake Inn. There was the usual comedy moment of trying to get Reuben over a stile which my friend Rae had not previously witnessed. For a forestry plantation the path is enjoyable and there was a fresh smell of pine in the air. Although the main road is close by you feel that you are in the middle of nowhere. 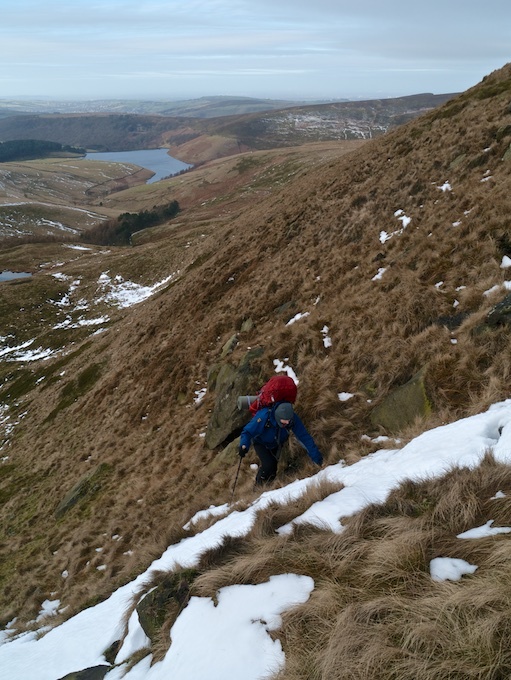 The path eventually deposits you onto open hillside and we contoured round to the deep gash in the hillside that is Oyster Clough. It was here whilst I was not paying much attention Rueben spotted some sheep just at the moment his lead slipped out of my hand. Luckily it was one of those extendable ones which whilst being dragged behind him distracted him long enough for me to recapture him. Disaster averted! Sitting in the sun on the other side of the clough there was a real taste of Spring in the air with the sun warming our faces. 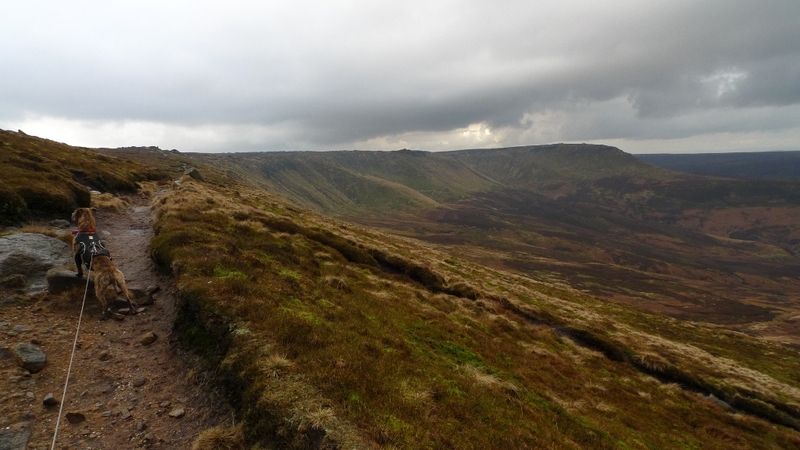 Kinder Scout was now beginning to reveal itself as banks of low cloud and mist quickly lifted. 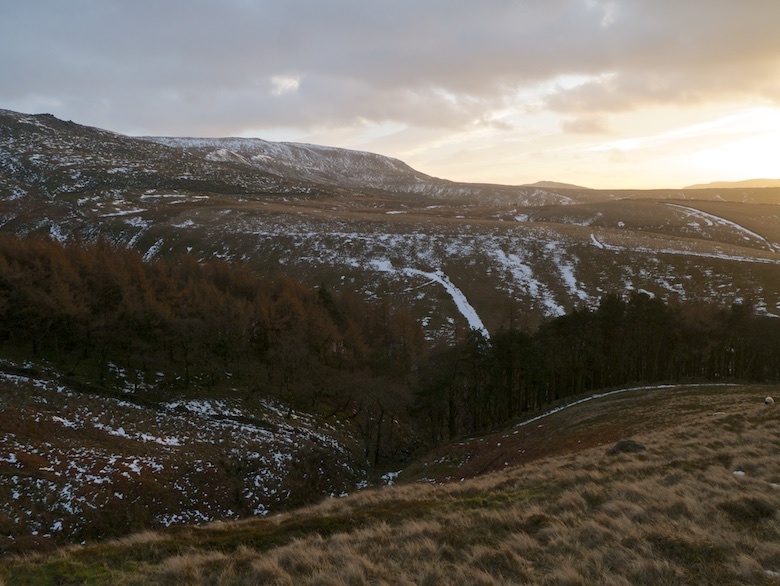 Oyster clough itself is a great way of getting onto the Bleaklow plateau and if you continue north you will find yourself high above Alport dale, the best spot in the entire Peaks (I think that I may have mentioned that a fair few times now!). 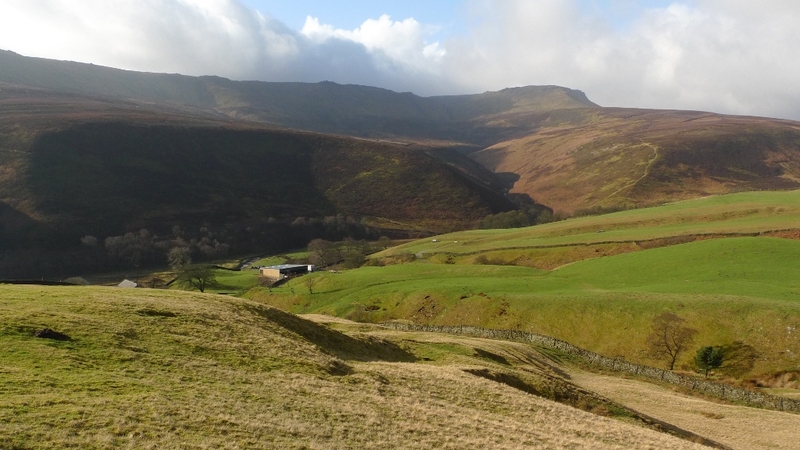 However we turned our backs on it and continued on easy paths towards Hayridge farm and Alport bridge on the busy Snake Pass. Following the right of way on the other side of the road we came to a sign saying that the path was closed due to a collapsed footbridge. The sign said that there was no other alternative. Indeed after further inspection the bridge was a mess of wood and metal. However right next to it is a shallow ford no more than a couple of inches deep which we crossed with considerable ease. Why the path had to be closed because of the bridge is beyond me, surely a ‘Bridge down’ sign would be much more appropriate? Climbing above the river the Woodlands valley painted a very pretty wild scene, especially once the busy main road was out of view. 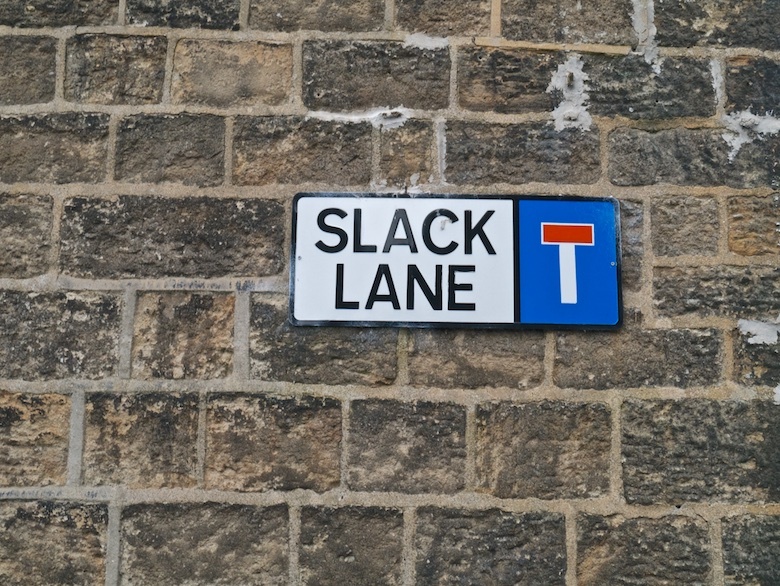 It was only the constant sound of traffic that spoilt things. 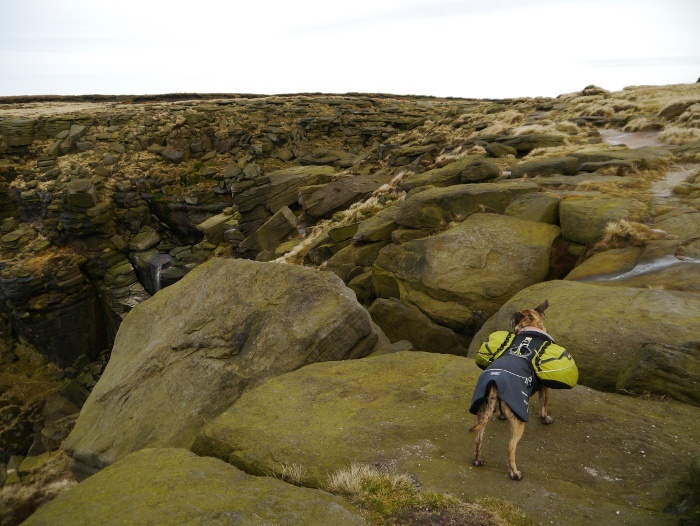 We skirted around the buildings of Upper Ashop onto open access land and followed the track to the shooting cabin. 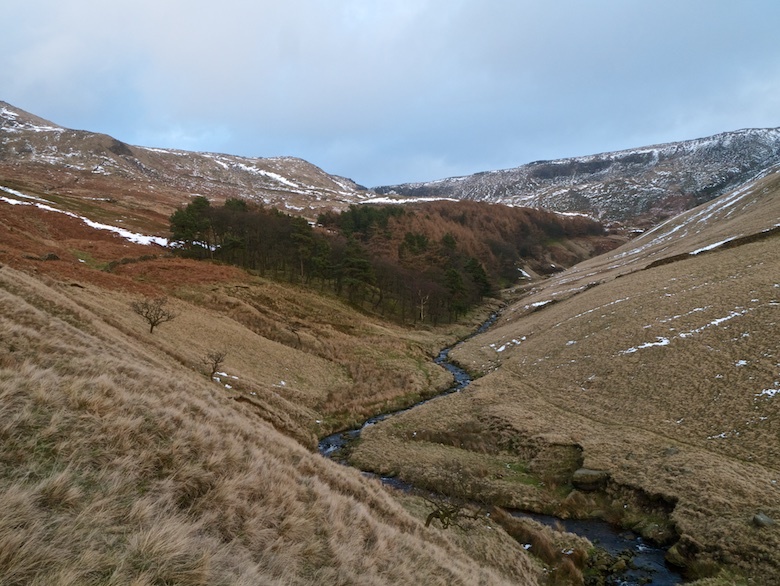 I had initially planned to contour the hillside from here to the rocky depths of Blackden brook, but in the end could not be bothered. 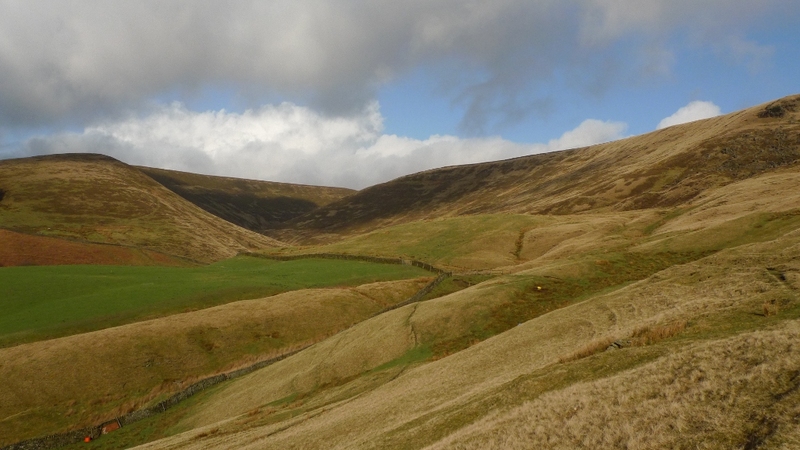 Instead we walked easy ground to the edge of the plateau near Crookstone Knoll. On the heathery heights the changing light was magical, fluffy clouds scudding quickly though the sky leaving a patchwork of shadows. It was now no longer spring with a biting wind removing all warmth from the winter sun. 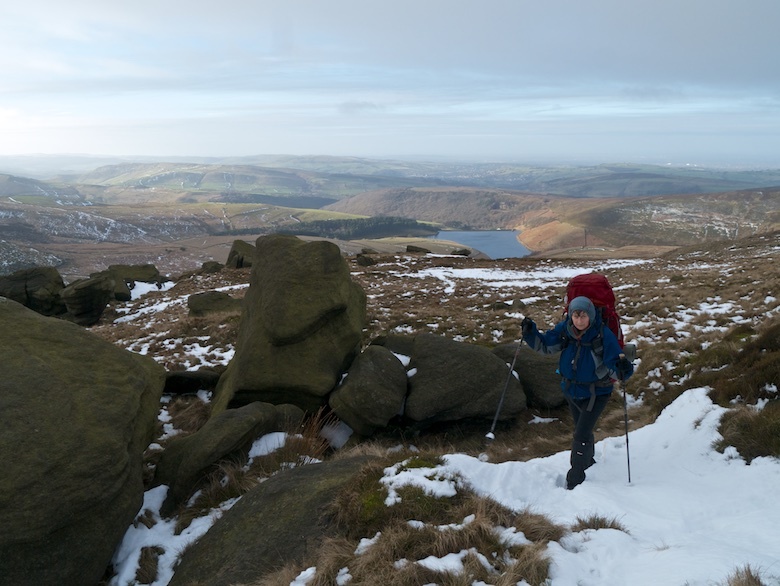 There is one essential bit of kit on Kinder at this time of year, a bit of kit we had both forgotten to pack. Deep black squelchy peat demands that you wear gaiters and it was a real effort to stop ourselves from becoming coated in the stuff from the waist down. A battle we soon lost. Rueben on the other hand simply did not care, within minutes he looked like he had been painted black from the belly down. He was totally lost in doggy heaven! 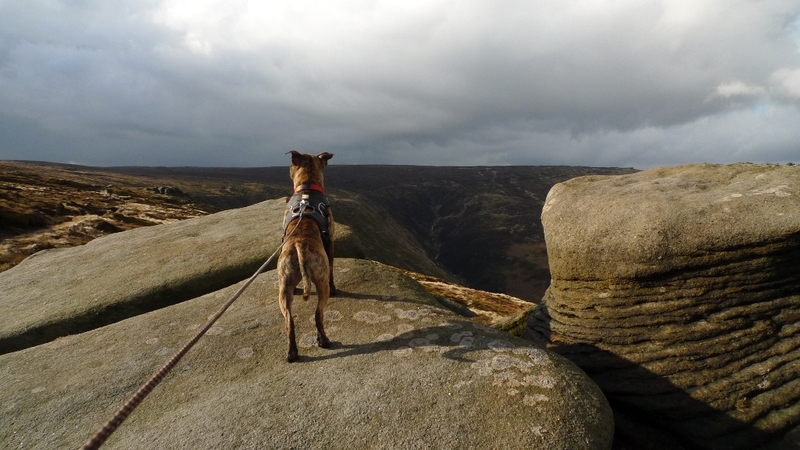 Every now and then the edge is punctuated with gritstone outcrops, perfect places to get the dog to pose for a photo. 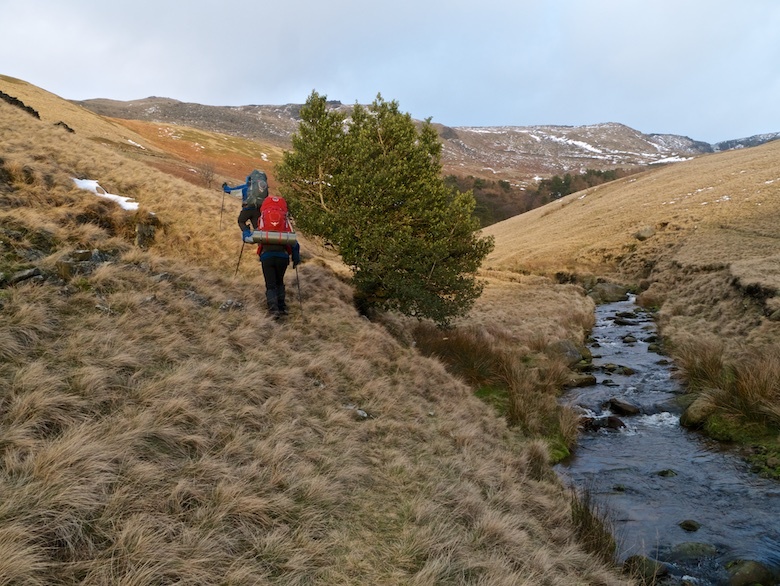 We soon approached the head of Blackden Brook, where we had originally planned to ascend from. From above it looked impossibly steep, an illusion you often get when looking down into the cloughs. I will have to return one day to climb up though its rocky depths. The path along the edge marches ever onwards, every now and then turning into firm sand, a welcome respite from the deep soft peat. 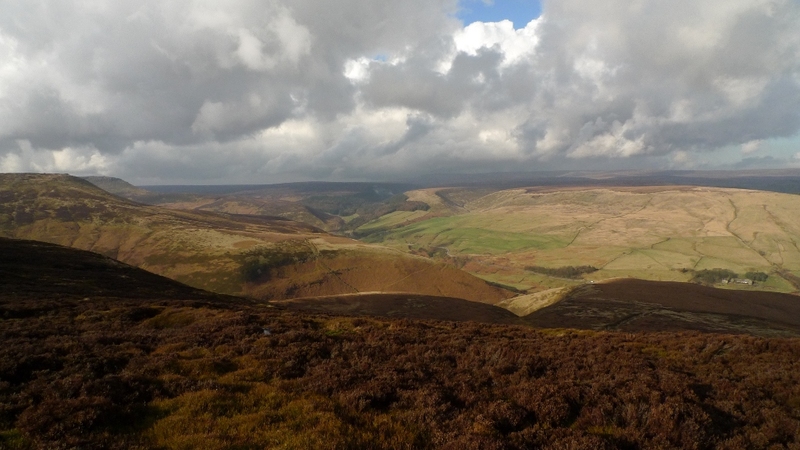 Fairbrook Naze was our next major destination, sticking out from the main body of the hill like the prow of a ship. Approaching the Naze the weather suddenly and very dramatically changed. A heavy squally hail storm came in from nowhere battering us with pellets of ice. There was suddenly panic in Reubens eyes as they pounded his face and he did not know what to do with himself. In the end he put his back to the wind and tried to make himself as small as possible, looking sad and pitiful. We found a large boulder to shelter him behind whilst the hail turned to rain and then snow before it stopped. The skies soon cleared, this time a washed pale blue in front with heavy clouds behind us making the landscape dark and foreboding. 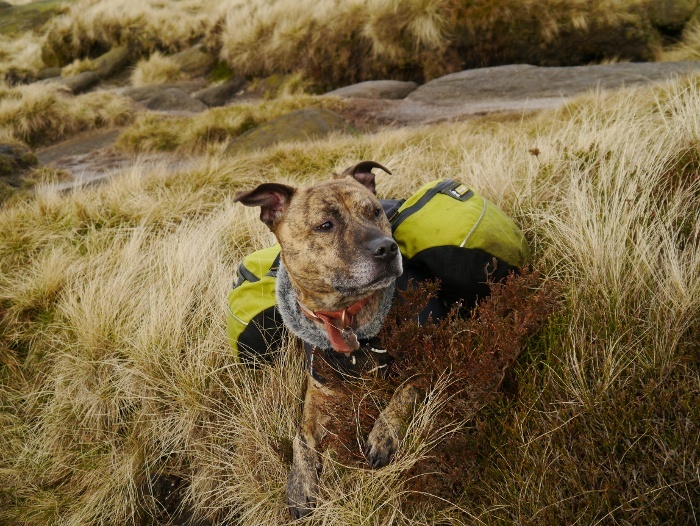 Reuben recovered enough for a quick pose on top of a rock! 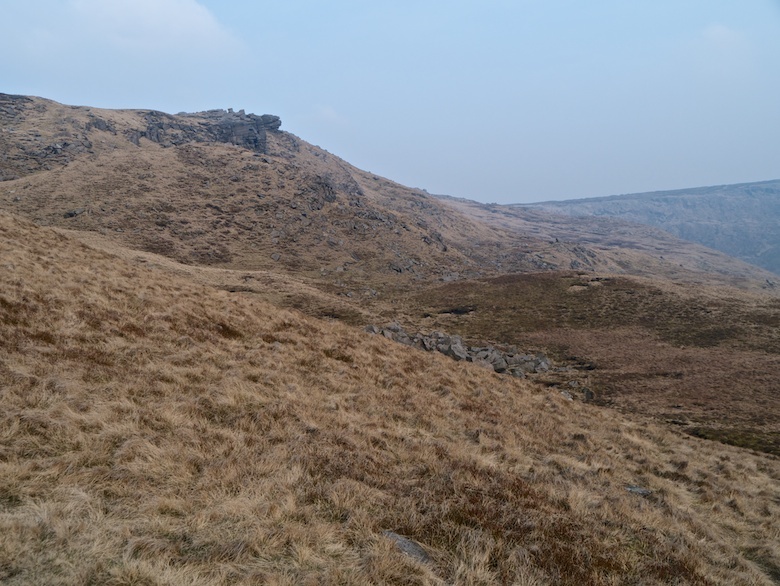 We turned west and headed across what was now the true northerly part of Kinder. The light slowly changed once again becoming warmer as the sun slowly sunk towards the horizon. 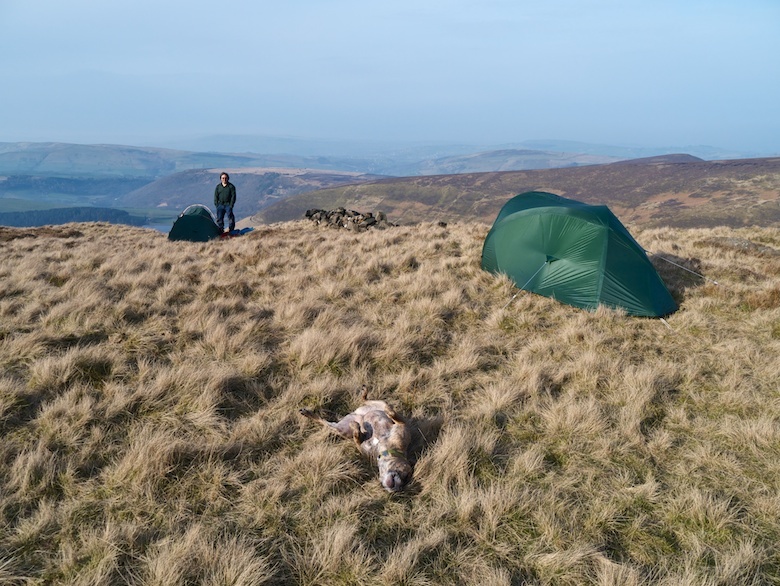 The peace however was shattered by the busy buzzing of a helicopter that was flying backwards and forwards over the plateau transporting large white sacks, part of the moorland regeneration project. 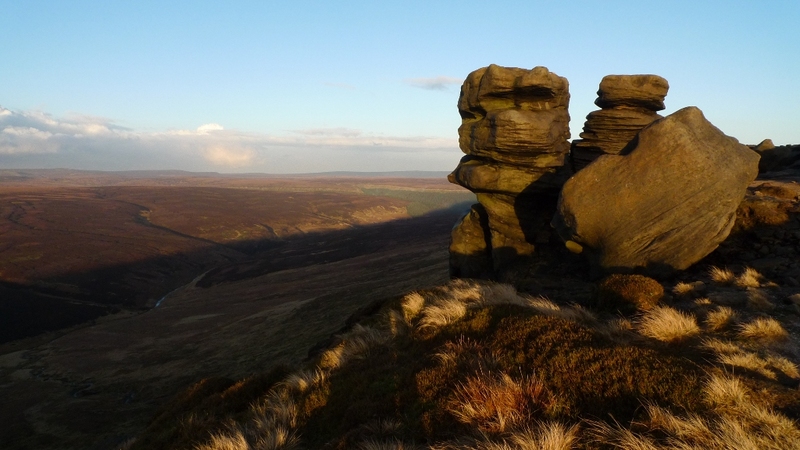 Here there are dramatic outcrops of rock overlooking an endless swell of moors. 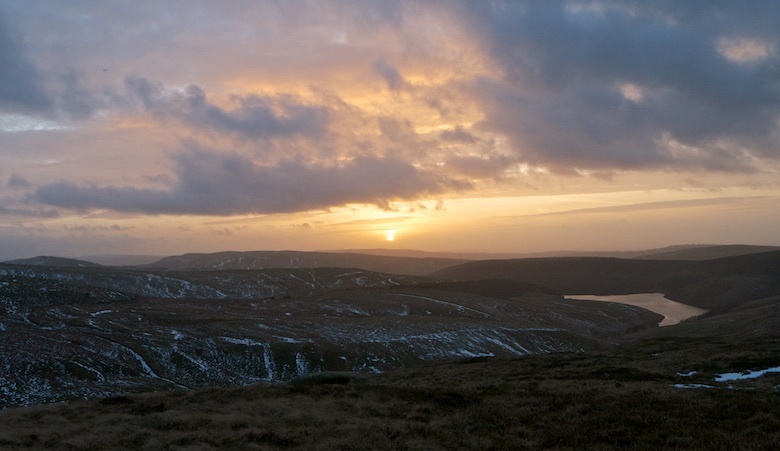 The sun was now in our faces as it made its final plunge towards the plateau edge. The clarity of the air was excellent with the glow getting warmer and warmer. However the temperature was not and you could feel that there was the promise of a frost in the air that night. 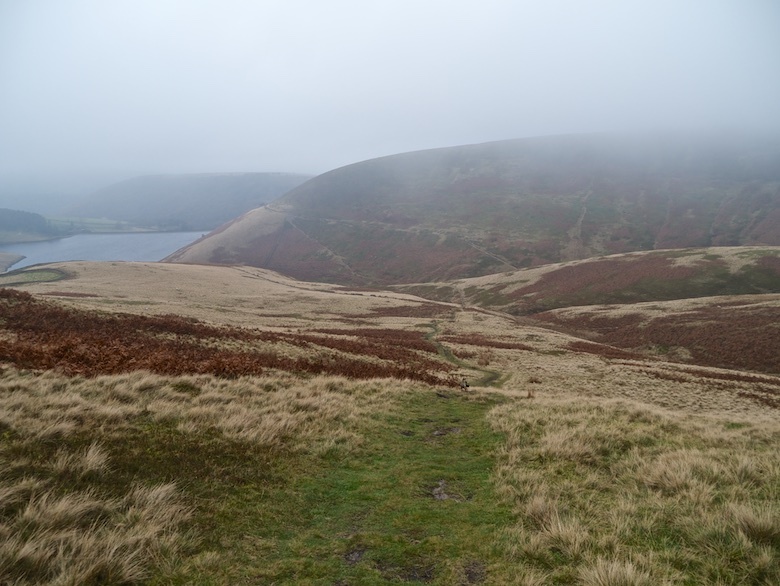 We made the steep descent down the Pennine way towards Mill Hill before branching off on the Snake Path. Normally I would curse flagstones but after hours of wet peat it was good to feel a solid surface beneath our feet. We yomped along making good progress until all of a sudden the flagstones vanished and the path became a wet morass close to the River Ashop. The state of the path and its difficulty really does take some beating as we sloshed through bogs up to our knees at some points. The gloom of dusk soon turned to darkness and headtorches were deployed to find the way. 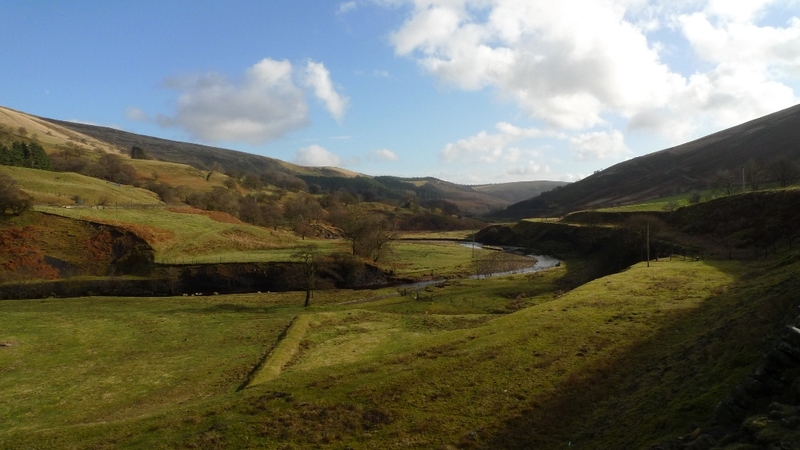 For some reason it has always been dark when I walk down this valley, so apart from the bogs have no idea what it looks like! It was pitch black by the time we reached the plantation , the dense trees cutting out all light. There were a few minutes when we knew the car park was only a couple of hundred metres away, yet we could not locate the correct path. The dazzling car headlights on the Snake pass were a bit of a shock when we finally emerged.